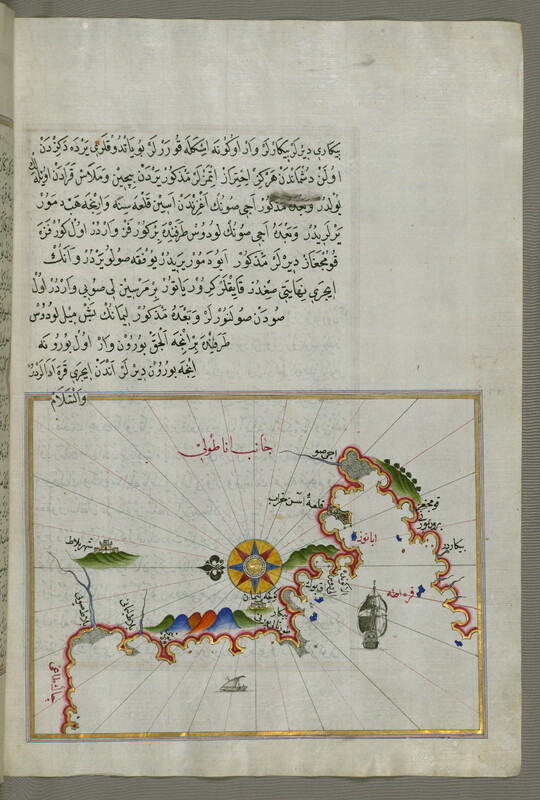 Originally composed in 932 AH / 1525 CE and dedicated to Sultan Süleyman I (the Magnificent), this great work by Piri Reis (d. 962 AH / 1555 CE) on navigation was later revised and expanded. 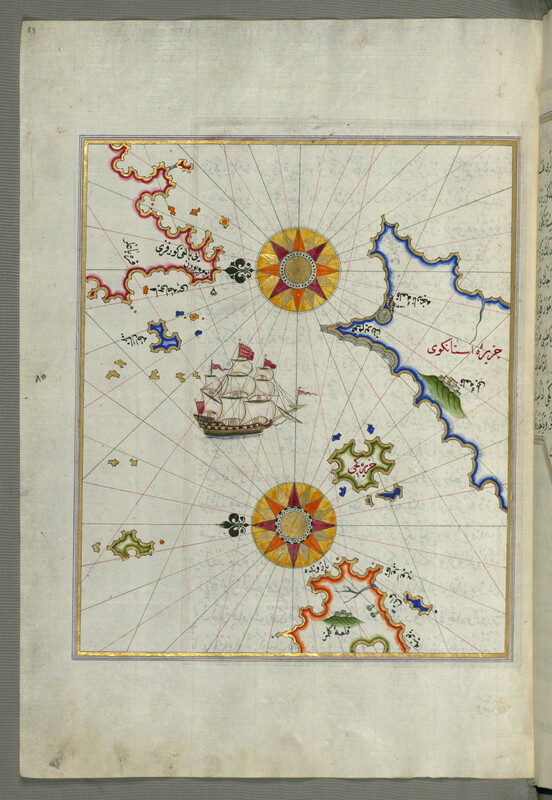 The present manuscript, made mostly in the late eleventh century AH / seventeenth CE, is based on the later expanded version and has some 240 exquisitely executed maps and portolan charts. 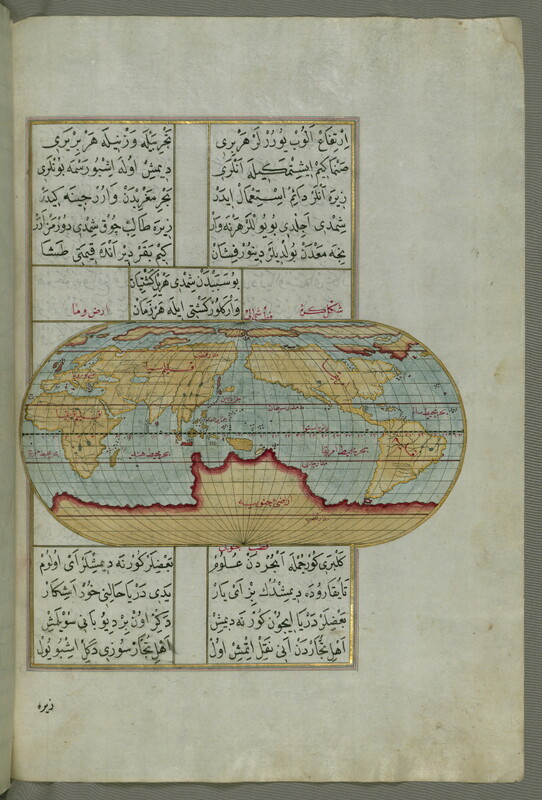 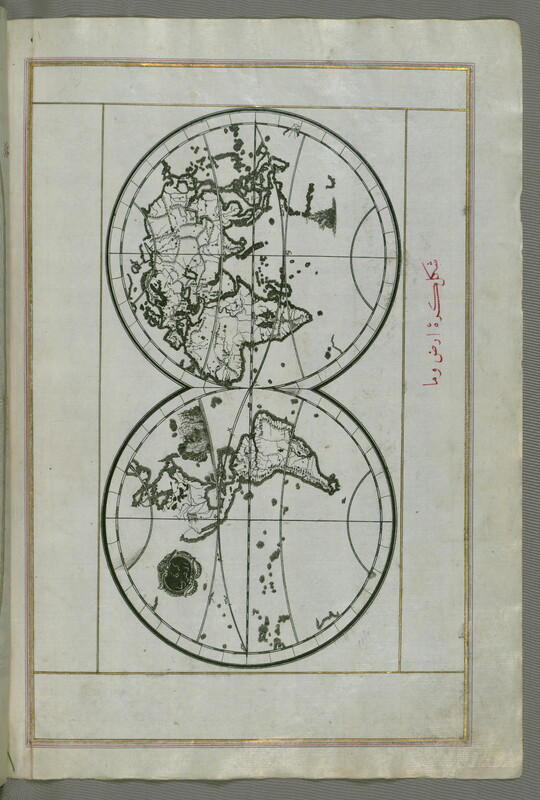 They include a world map with the outline of the Americas (fol. 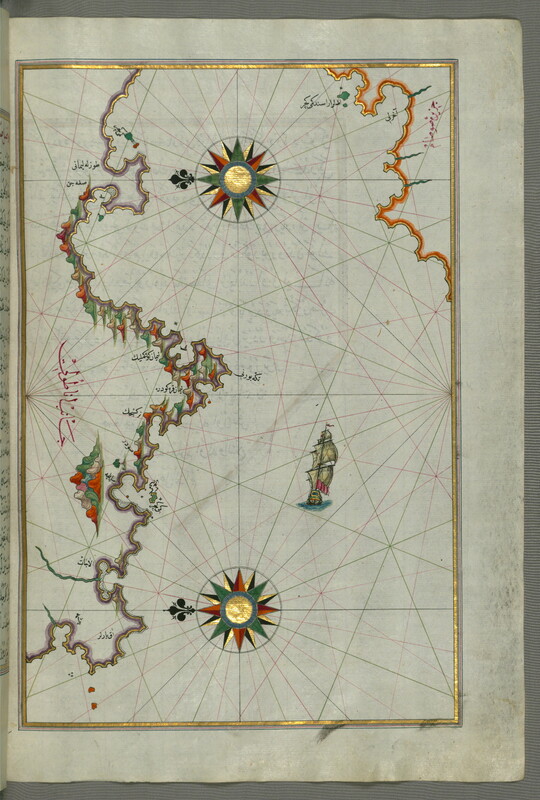 41a) and maps of coastlines (bays, capes, peninsulas); islands; mountains; and cities of the Mediterranean basin and the Black Sea. 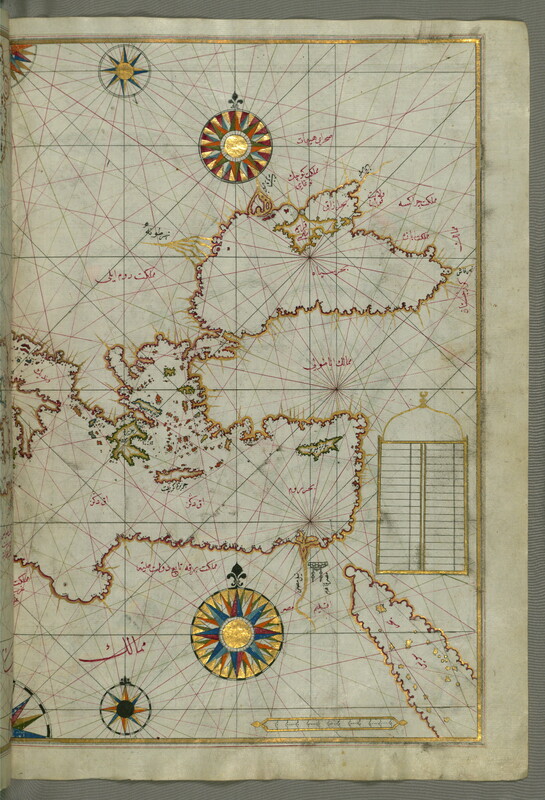 The work starts with a description of the coastline of Anatolia and the islands of the Aegean Sea, the Peloponnese peninsula, and the eastern and western coasts of the Adriatic Sea. 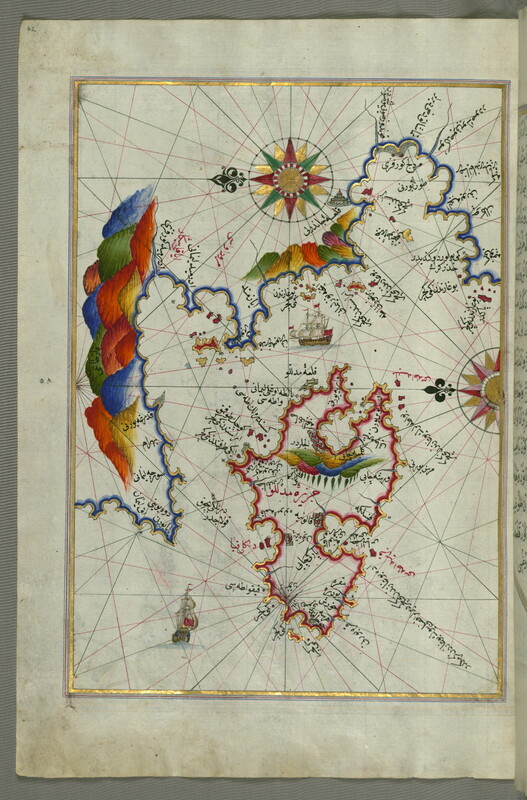 It then proceeds to describe the western shores of Italy, southern France, Spain, North Africa, Palestine, Israel, Lebanon, Syria, western Anatolia, various islands north of Crete, the Sea of Marmara, the Bosporus, and the Black Sea. 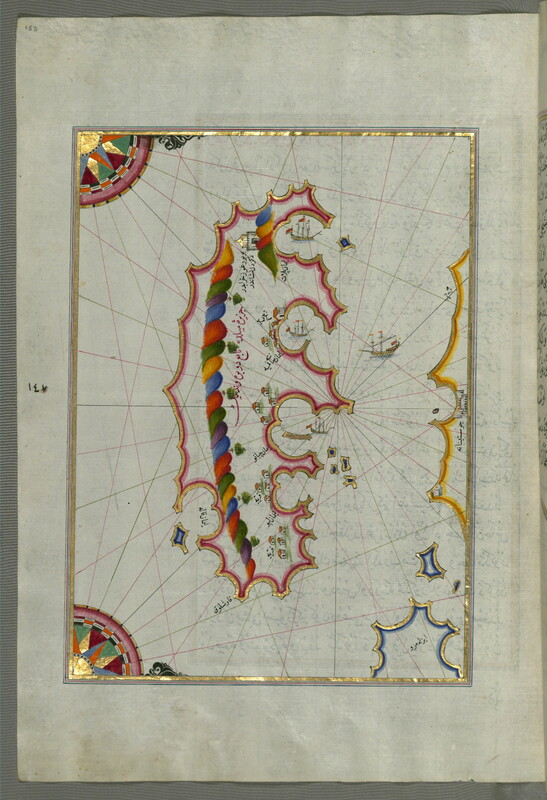 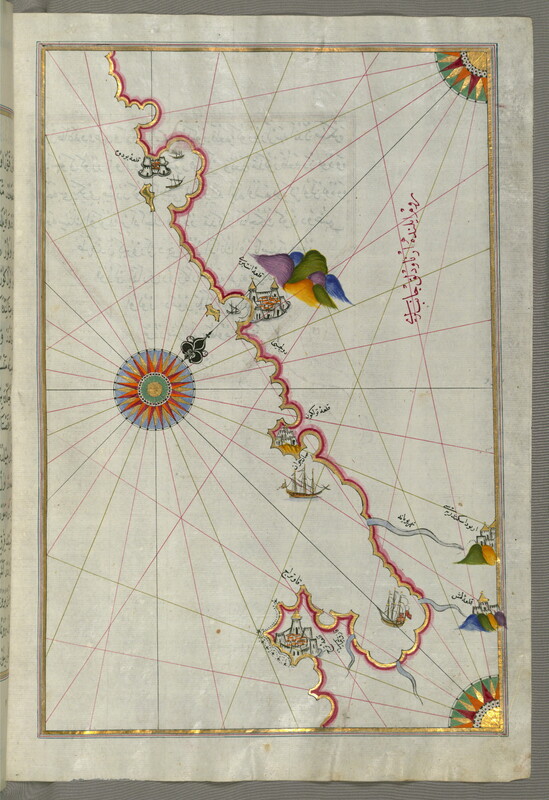 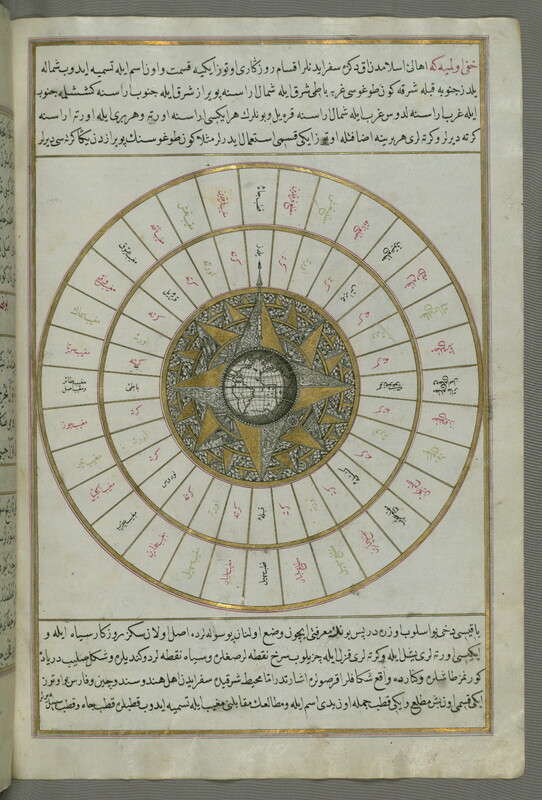 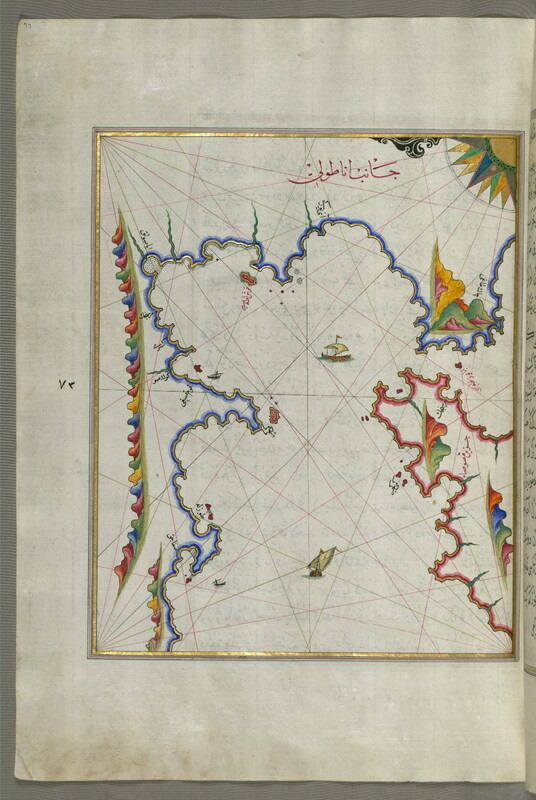 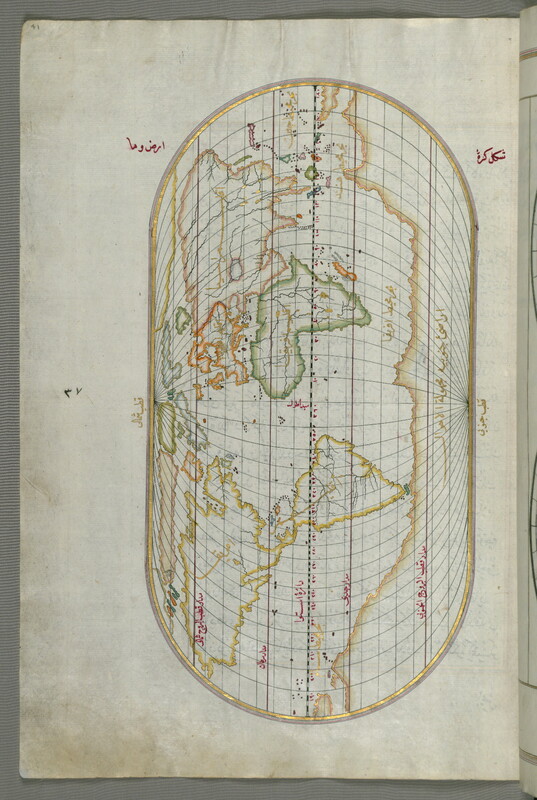 It ends with a map of the shores of the Caspian Sea (fol. 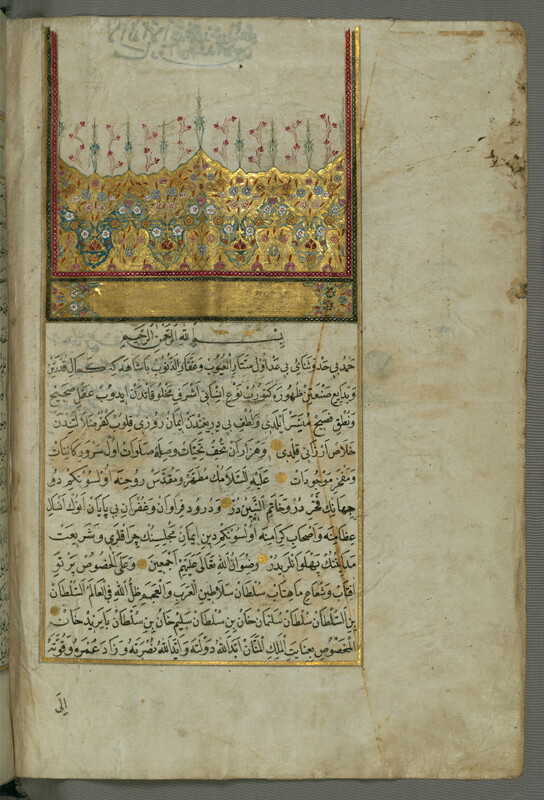 374a). 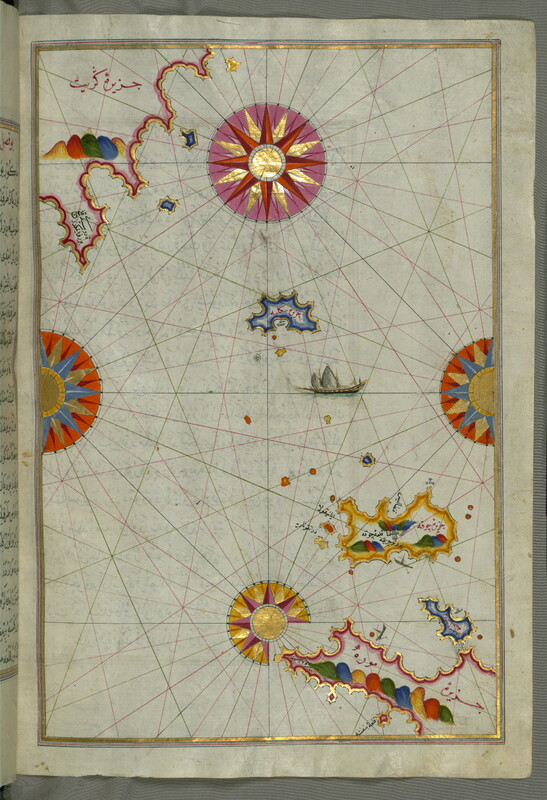 Label: This map shows the upper Aegean Sea with the islands of Imbros (Imroz, Gökçeada) and Bozca (Tenedos). 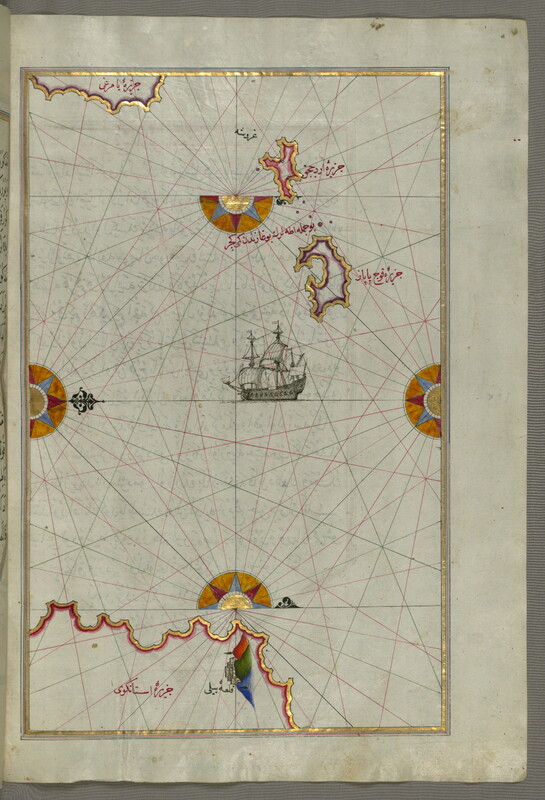 Label: This map shows the island of Bozjah (Tenedos) off the coast of Anatolia. 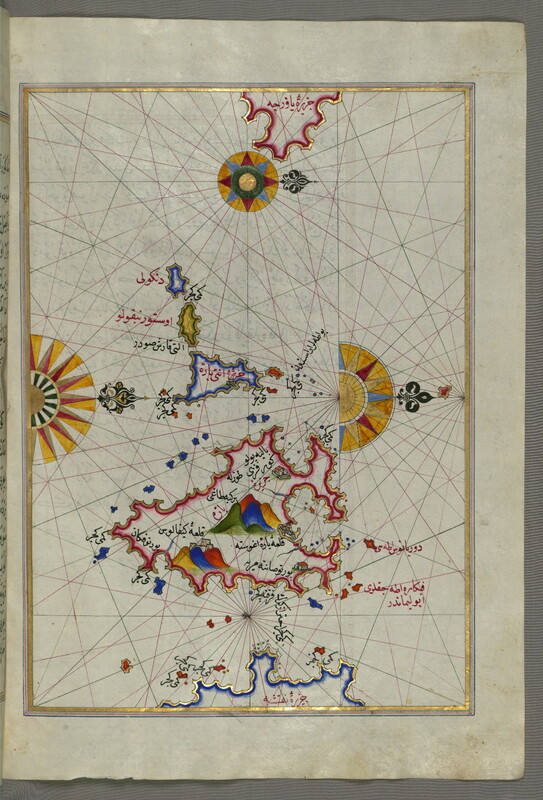 Label: This map shows the islands of Semendrek (Samothraki) and Imroz (Imbros) in the Aegean Sea. 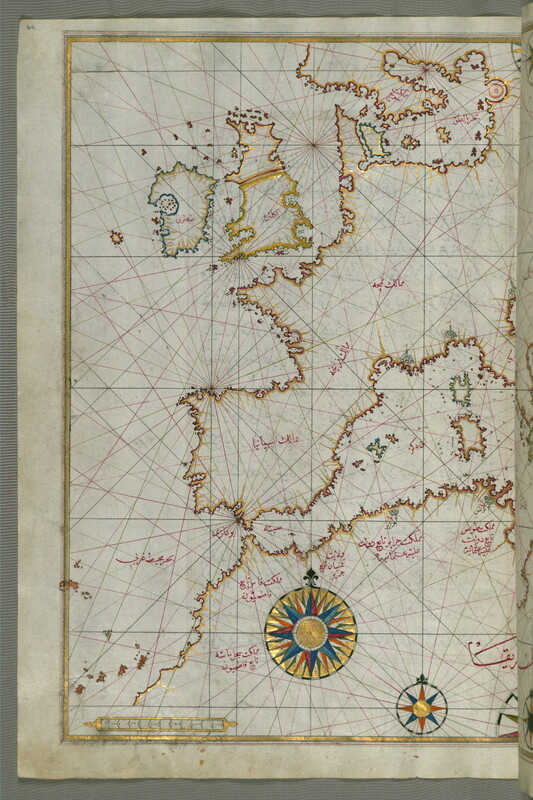 Label: This map shows part of the European coastline with the islands of Semendrek (Samothraki) and Imroz (Imbros, Gökçeada) in the Aegean Sea further south. 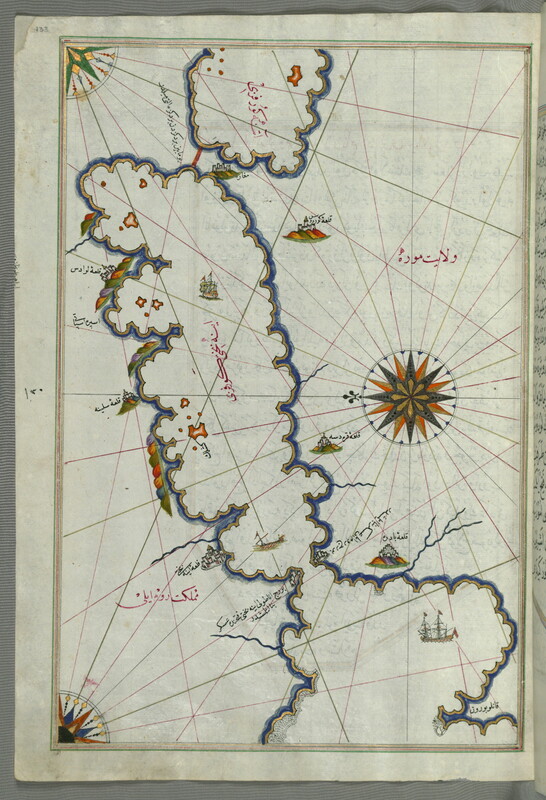 Label: This map shows the island of Lemnos (Limnos, Limni, Īlmelī), southwest of Imbroz in the Aegean Sea. 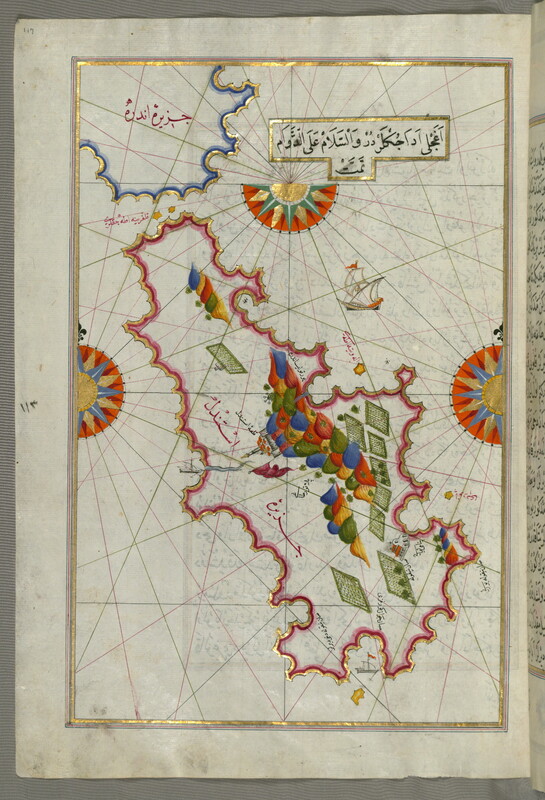 Label: This map shows the area west of the island of Thasos (Taşöz) and the Ayion Oros peninsula. 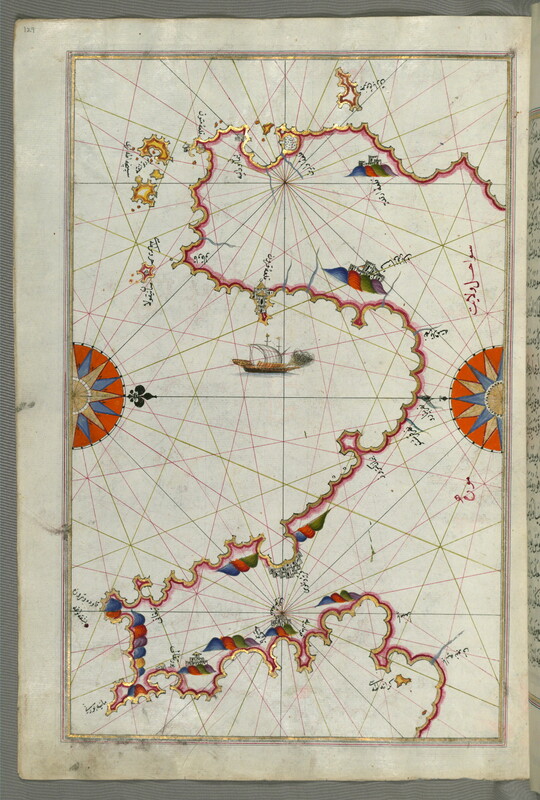 Label: This map shows the Bay of Salonica (Selānīk, Thessaloniki). 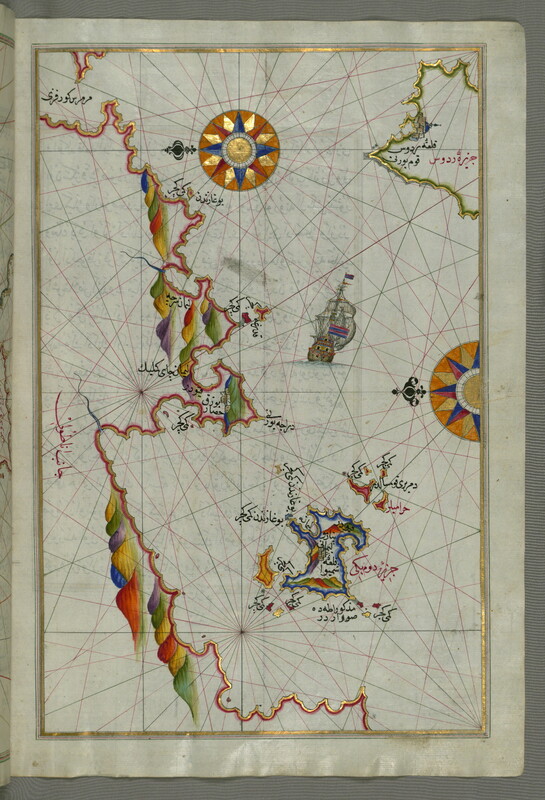 Label: This map shows the Bay of Salonica (Selānīk, Thessalonici) and the western coastline. 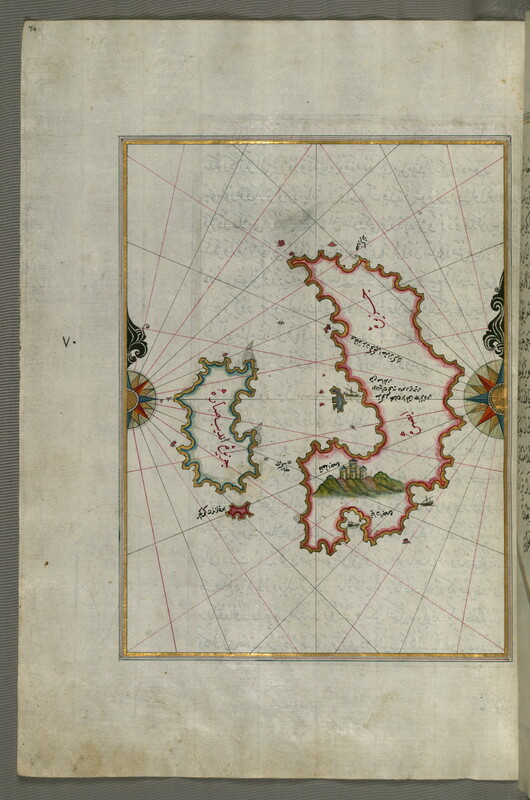 Label: This map shows the islands of Skyros (İskire) and Euboea (Evvoia, Aghrībūz, Eğriboz). 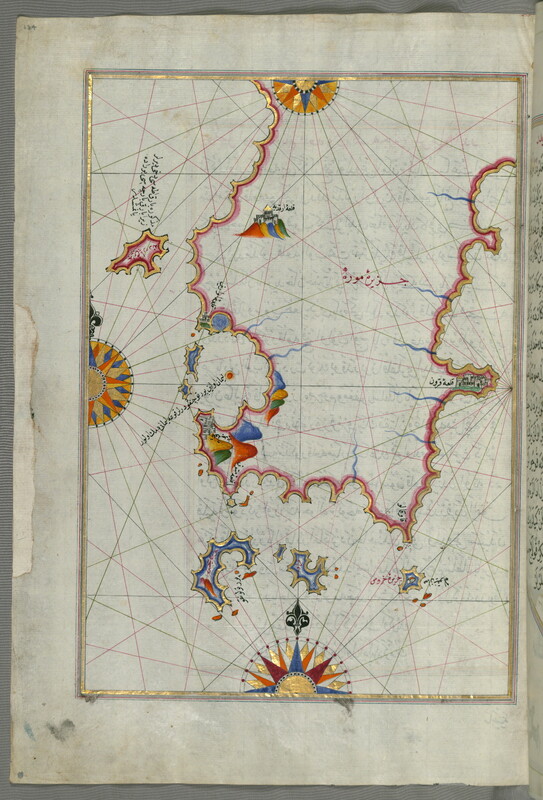 Label: This map shows the island of Midilli (Midillü, Mitylene, Lesvos) in the northeastern Aegean Sea. 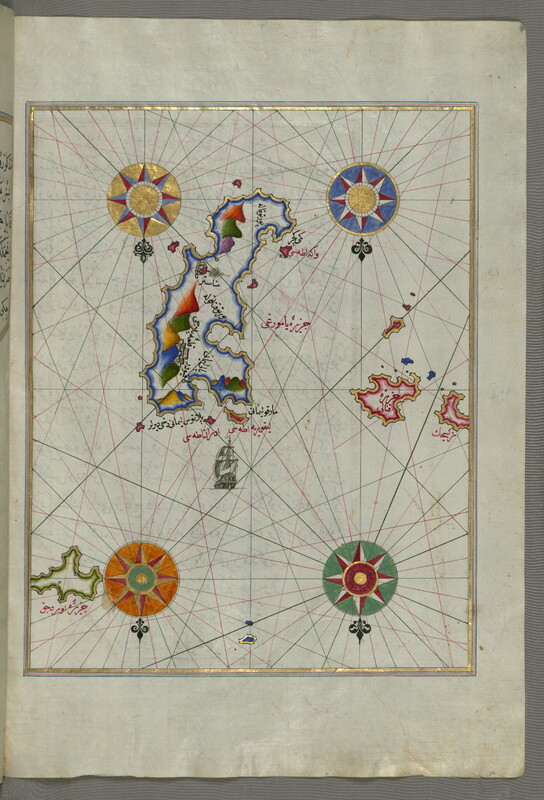 Label: This map shows the sea of Marmara and the islands of the eastern Aegean Sea from Semendrek (Samothraki) as far as Chios (Sakiz, Ṣāqiz). 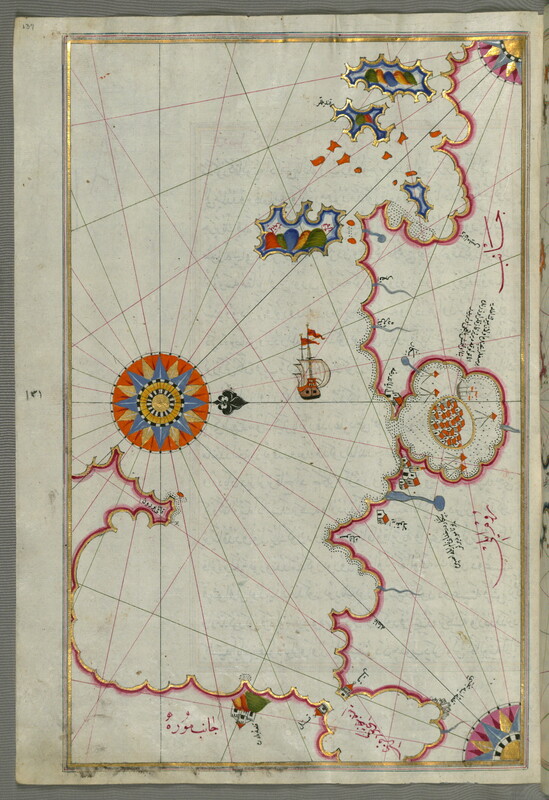 Label: This map shows the coastline of the western Aegean Sea as far south as the Island of Euboea (Evvoia, Aghrībūz, Eğriboz). 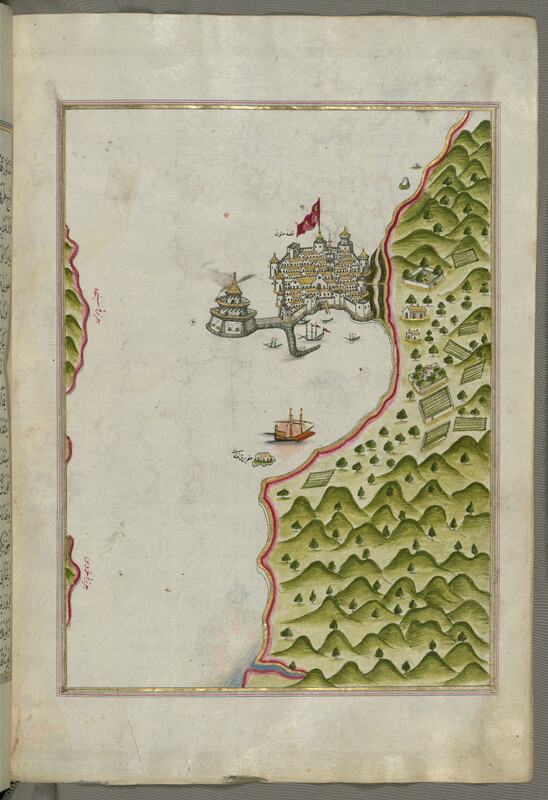 Label: This map shows the Anatolian coastline around the Bay of Izmir (Smyrna) with two Izmir fortresses. 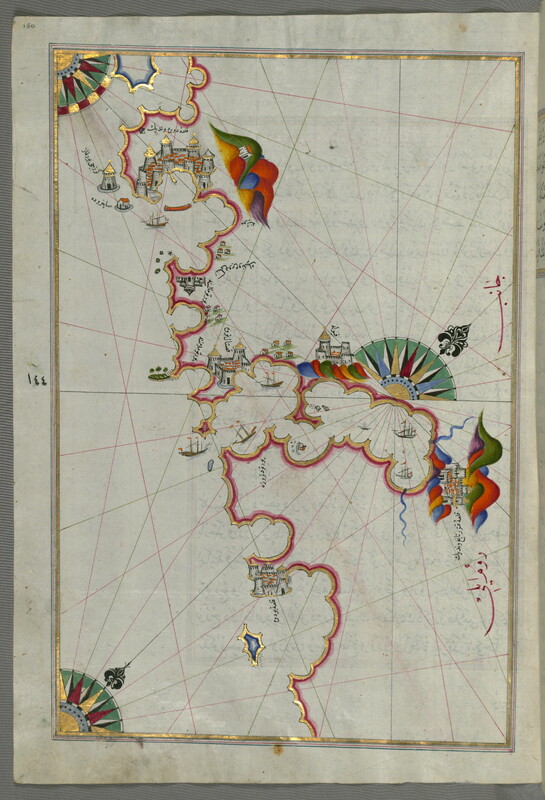 Label: This map shows the island of Chios (Sakiz, Sāqiz) facing Kysos (Çeşme) fortress on the Anatolian side. 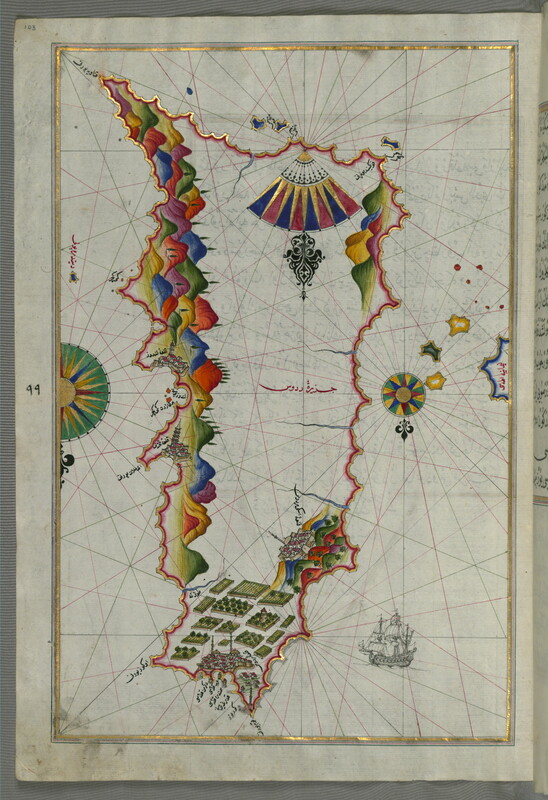 Label: This map shows a detail of the island of Chios (Sakiz, Ṣāqiz) with its fortress and other topographical features. 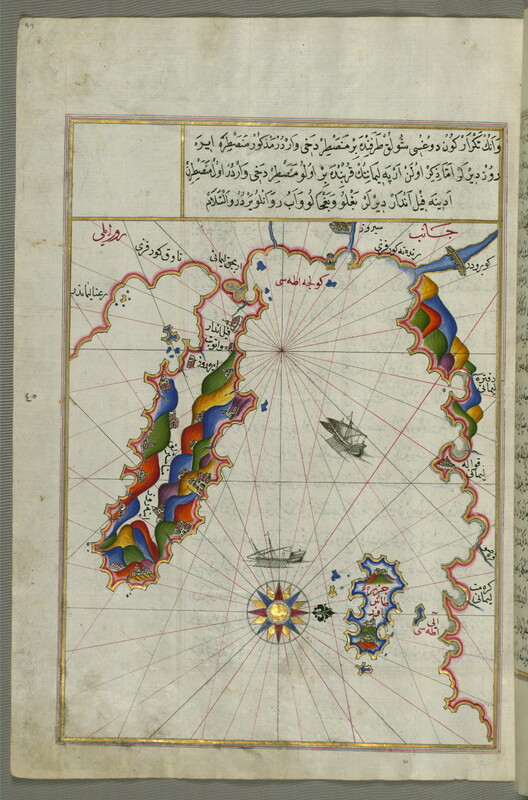 Label: This map shows the island of Psara (İpṣara) west of Chios (Sakiz, Ṣāqiz). 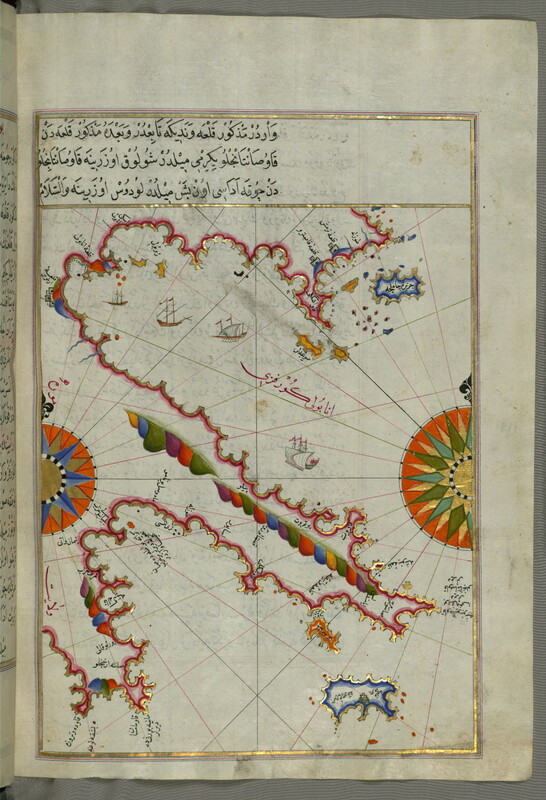 Label: This map shows the Anatolian coastline facing the island of Samos (Ṣūṣām). 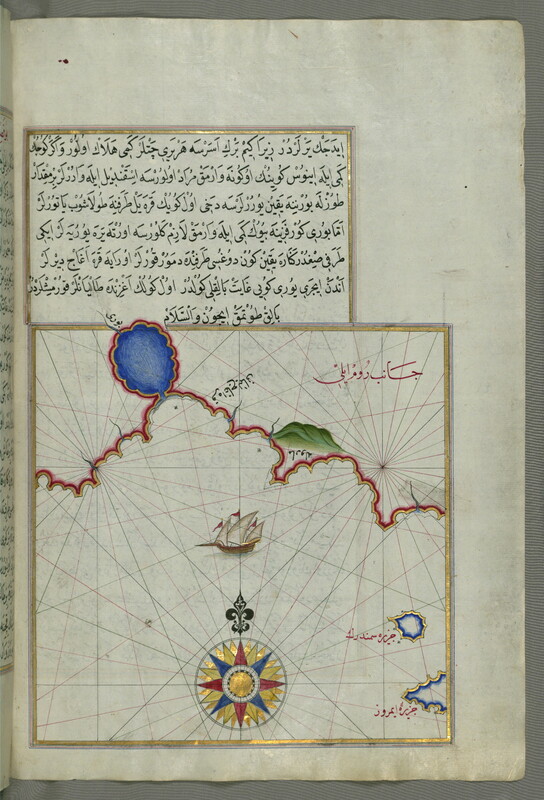 Label: This map shows the island of Samos (Ṣūṣām). 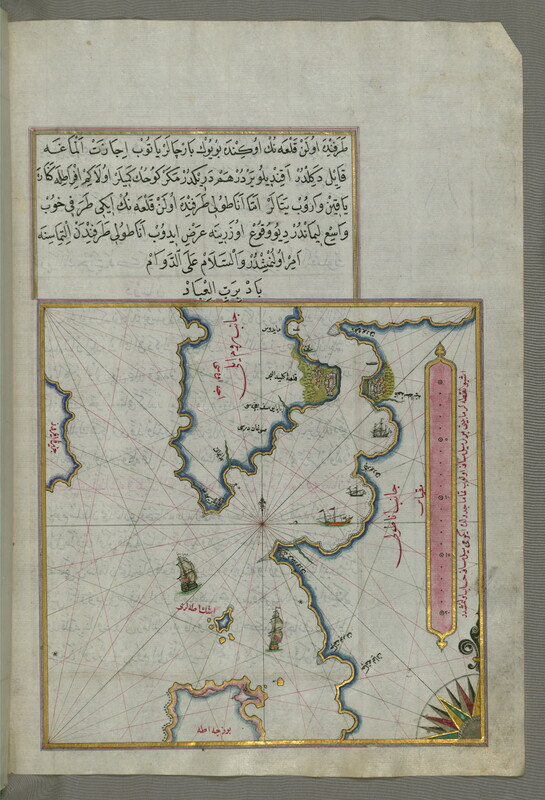 Label: This map shows two small islands off the coast of Anatolia south of Samos (Ṣūṣām) and east of the city of Balat on the Anatolian side. 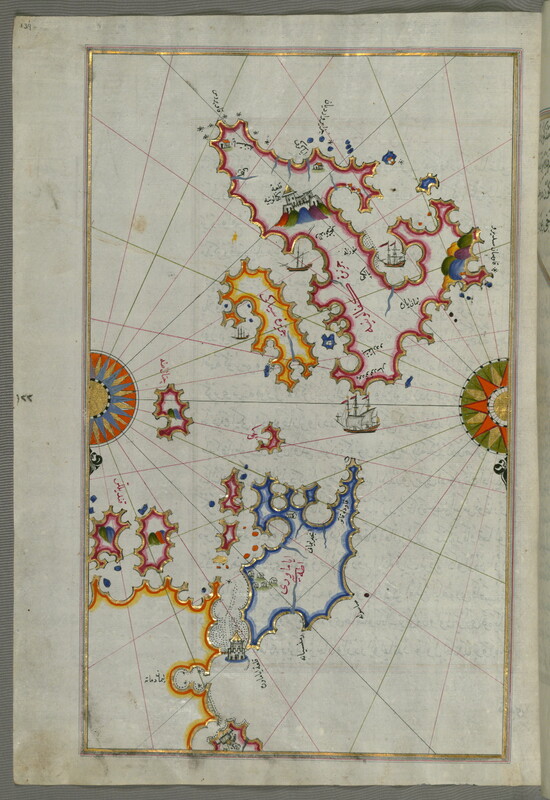 Label: This map shows several islands of the eastern Aegean Sea including Leros (Līrūs) and Patmos (Bāṭnūz). 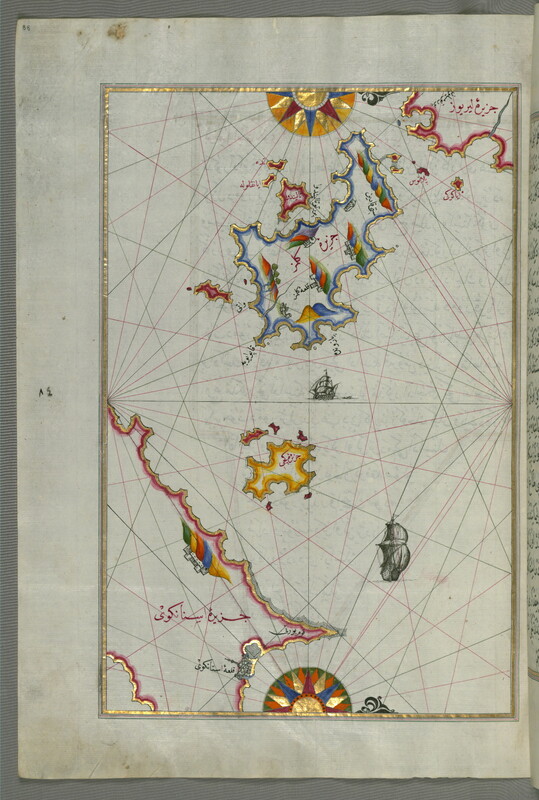 Label: This map shows the area between the islands of Ikaria (Ahikere) and Samos (Ṣūṣām) in the eastern Aegean Sea. 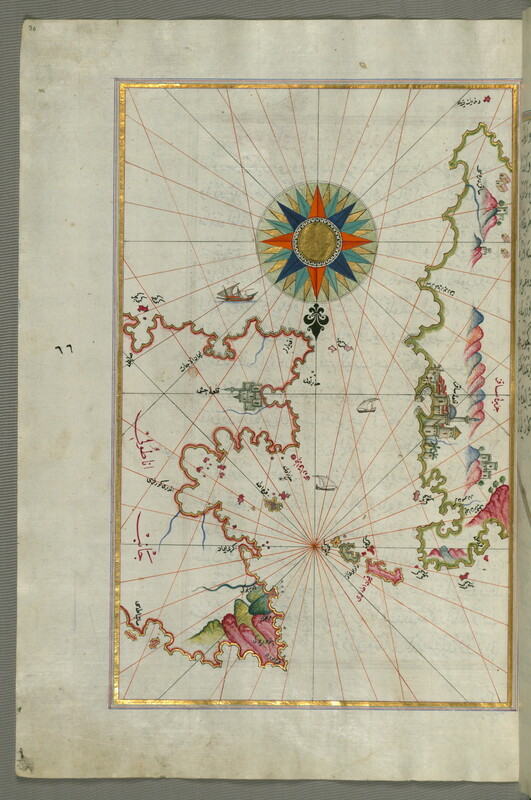 Label: This map shows the island of Ikaria (Ahikere) in the eastern Aegean Sea west of Samos (Ṣūṣām). 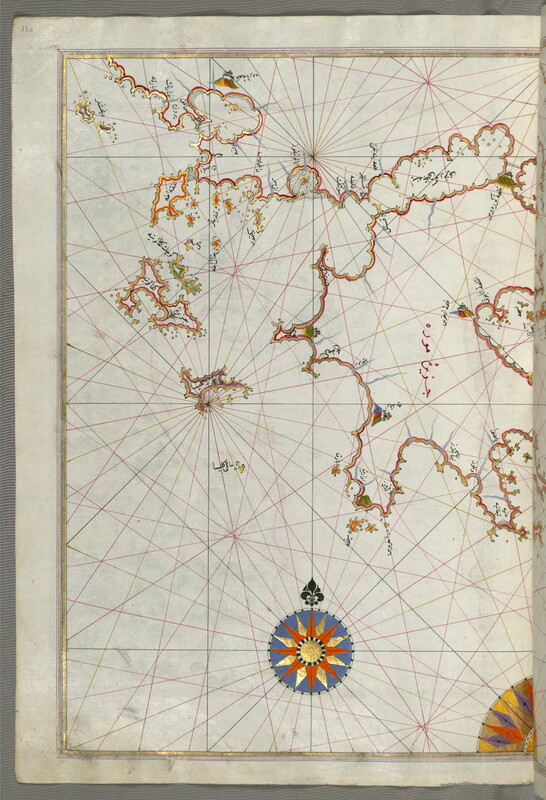 Label: This map shows the island of Patmos (Bāṭnūz) southeast of Ikaria (Ahikere) in the eastern Aegean Sea. 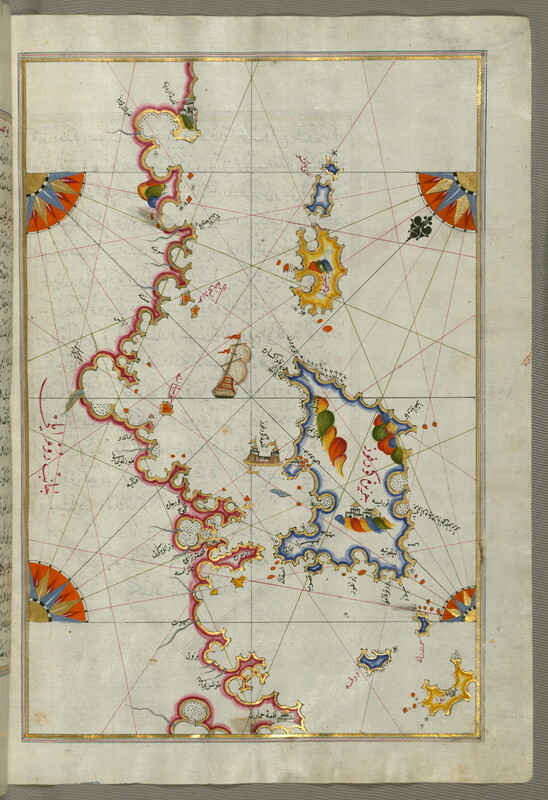 Label: This map shows the island of Leros (Līryūs) in the eastern Aegean Sea. 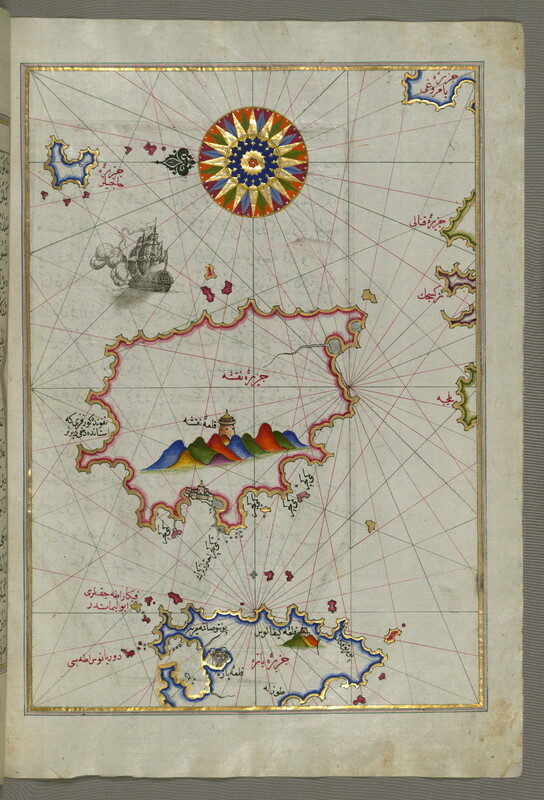 Label: This map shows the island of Kalimnos (Kalimaz) south of Leros in the eastern Aegean Sea. 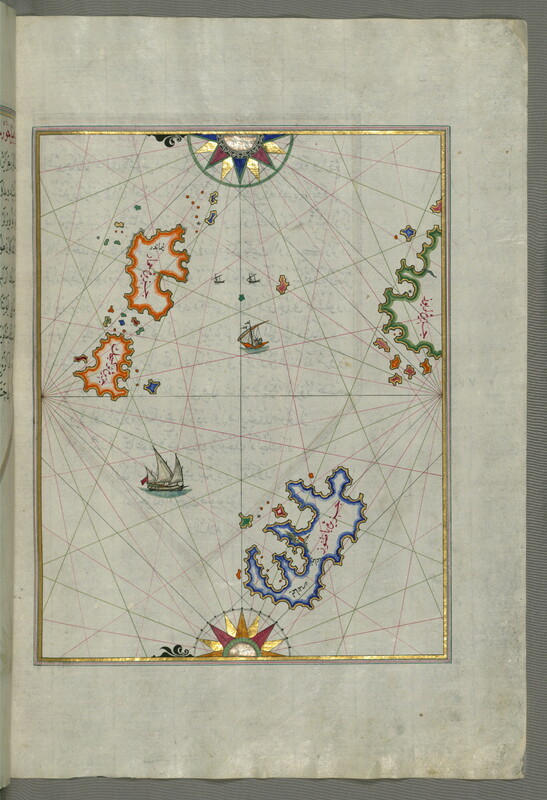 Label: This map shows the island of Cos (Stancho, İstanköy) facing the Anatolian mainland. 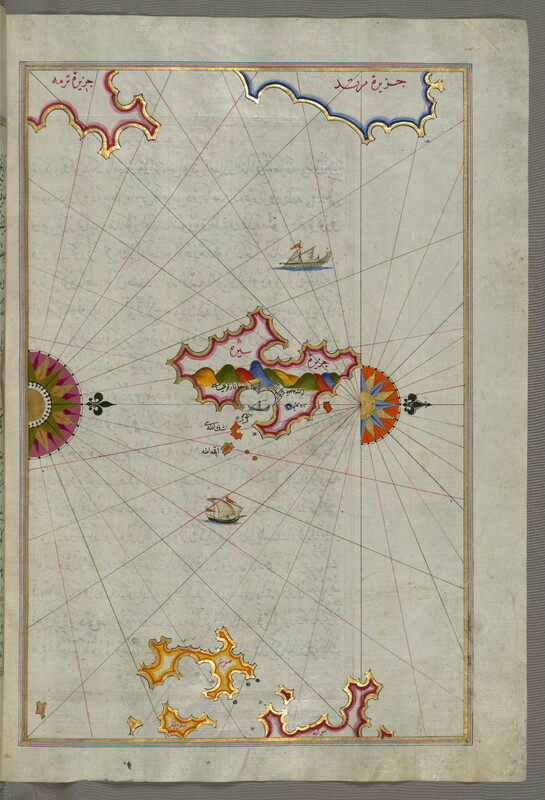 Label: This map shows the Anatolian coastline and the small island of Kara (Qarah) east of the town of Balat. 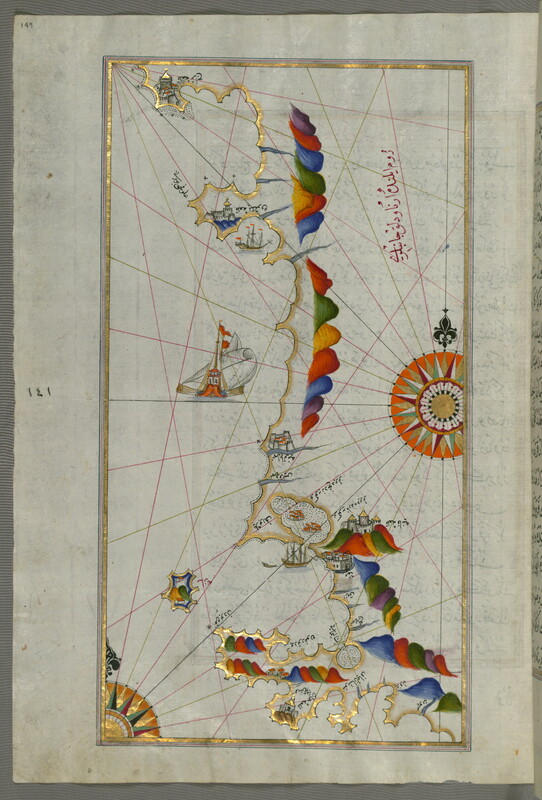 Label: This map shows the Anatolian coastline facing the island of Cos (Stancho, İstanköy). 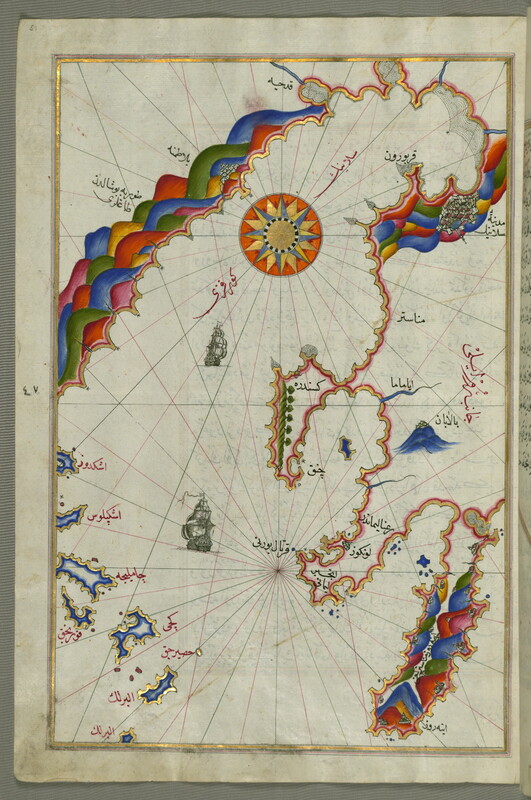 Label: This map shows the island of Cos (Stancho, İstanköy) off the Anatolian coast in the eastern Aegean Sea. 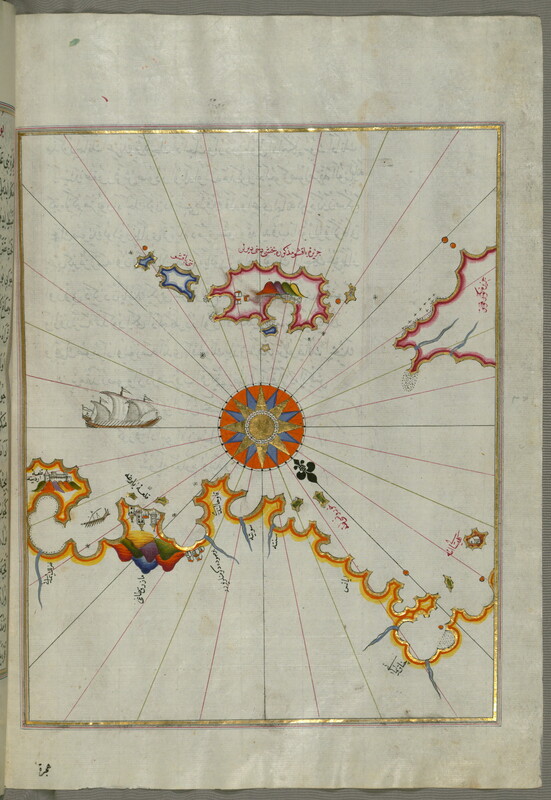 Label: This map shows the Bay of Kerme east of the island of Cos (Stancho, İstanköy). 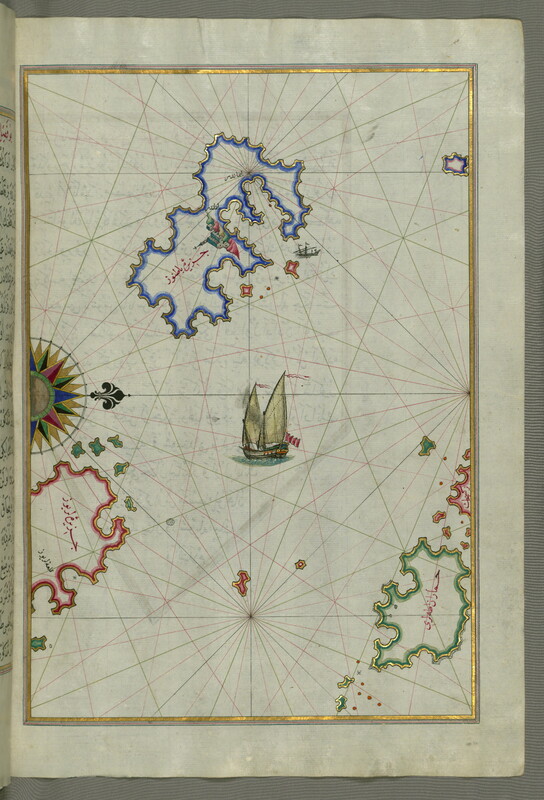 Label: This map shows the island of Syme (Sömbeki) northwest of the island of Rhodes (Rodos). 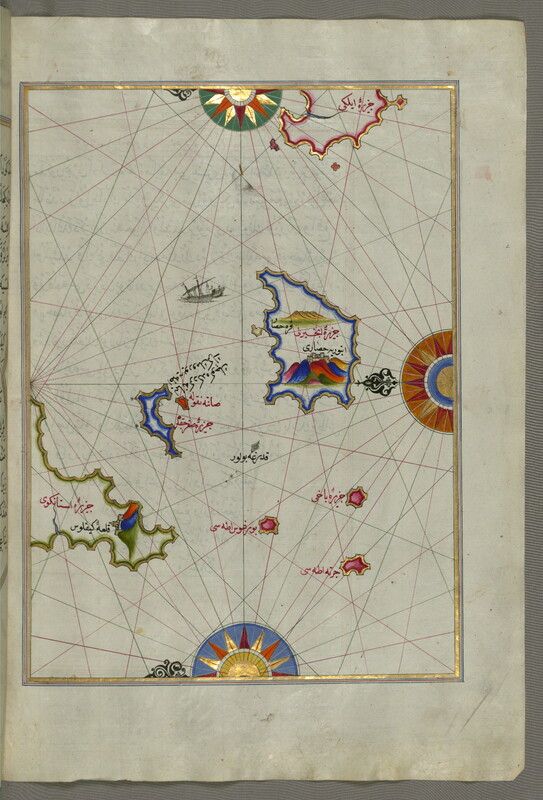 Label: This map shows the northeastern tip of the island of Rhodes (Rodos, Rūdūs) facing the Anatolian coast with the island of Syme (Sömbeki). 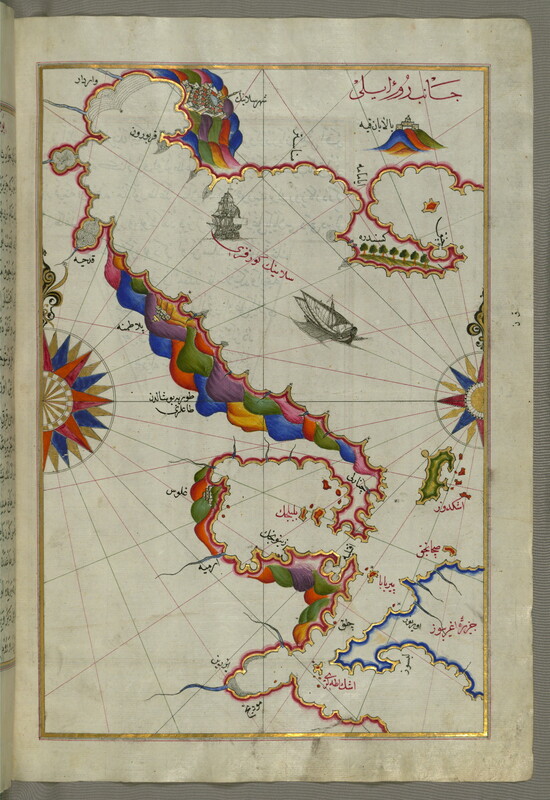 Label: This map shows the islands of the Aegean Sea including Chios (Sakiz), Cos (Stancho, İstanköy), Rhodes (Rodos), and Crete. 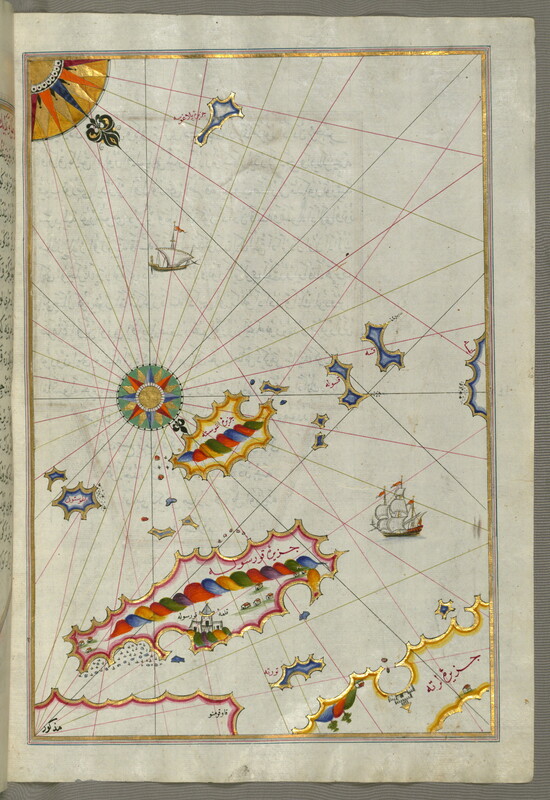 Label: This map shows the island of Rhodes (Rodos, Rudūs). 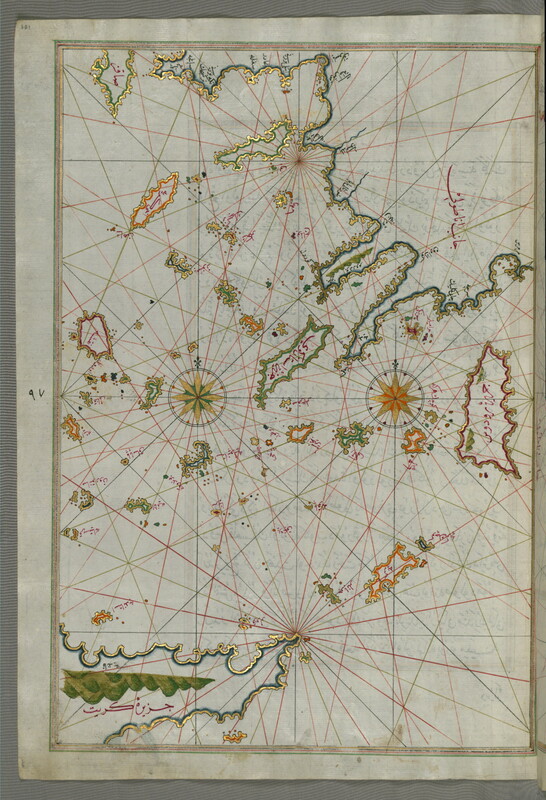 Label: This map shows the island of Chalkis (Herke) off the island of Rhodes. 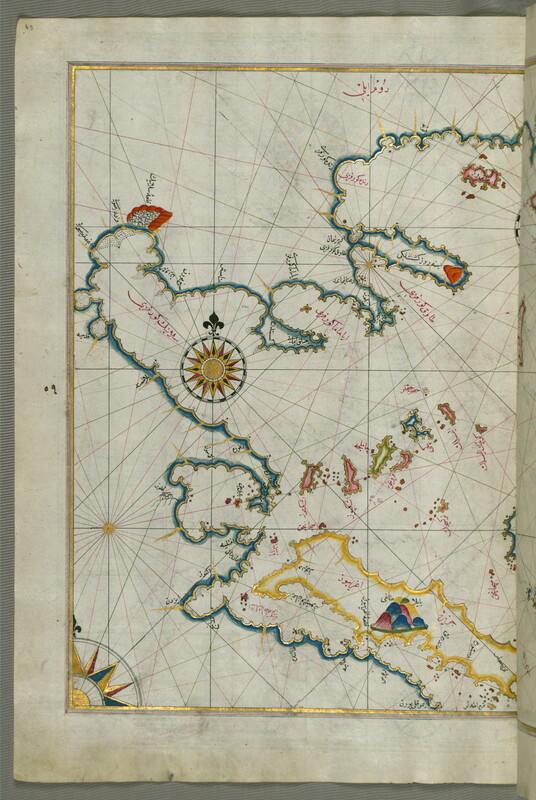 Label: This map shows the island of Telos (Episkopi, İlyaki) north of the island of Chalkis (Herke) in the eastern Aegean Sea. 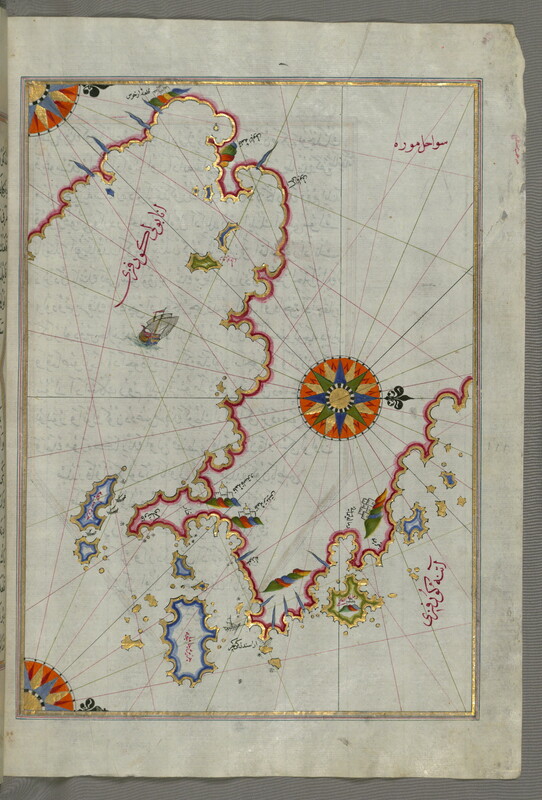 Label: This map shows the island of Nisyros (Inǧirlü) south of the island of Cos (Stancho, İstanköy) in the eastern Aegean Sea. 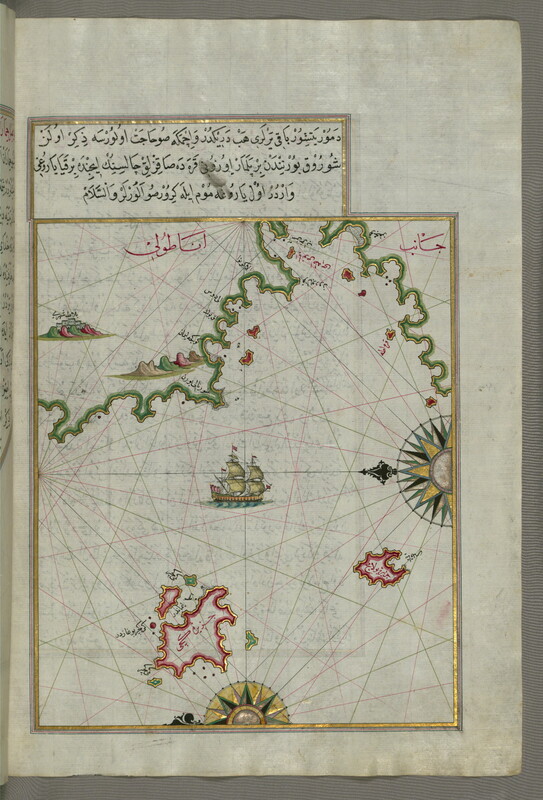 Label: This map shows two small islands between Amorgos (Yamurgi) and Cos (Stancho, İstanköy) in the eastern Aegean Sea. 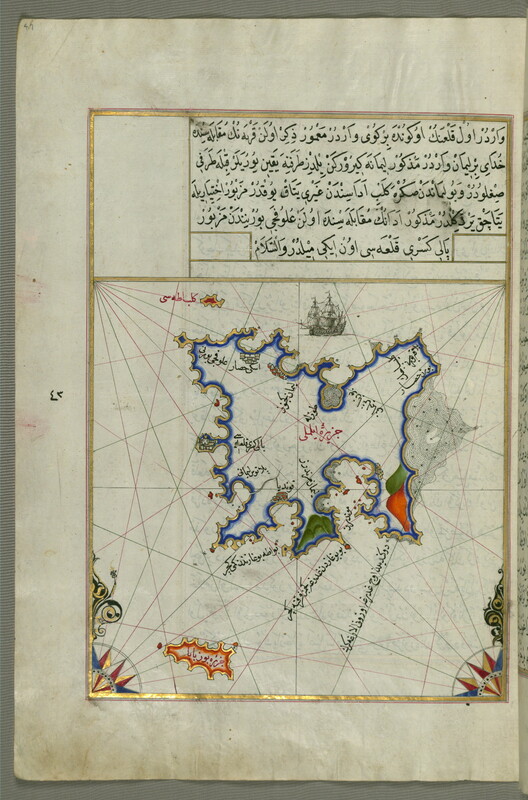 Label: This map shows the island of Amorgos (Yamurgi, Yamorki) in the southeastern Aegean Sea. 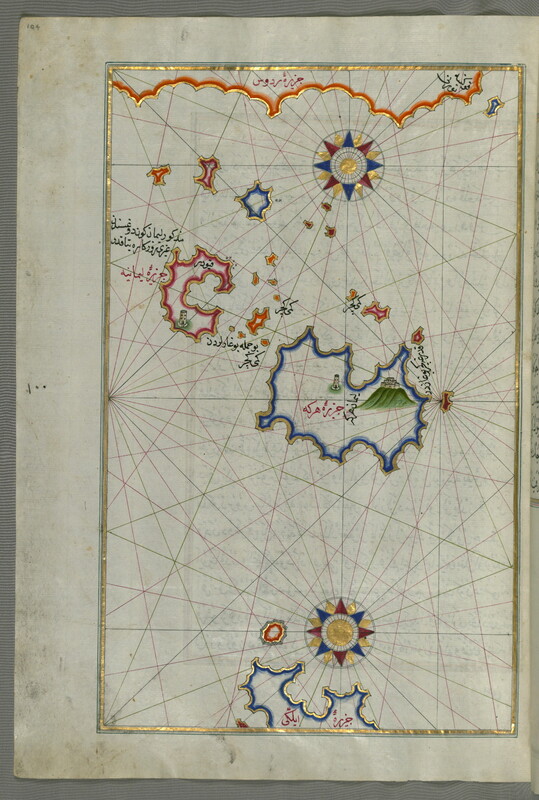 Label: This map shows small islands in the region of Naxos (Naḳşe) and Amorgos (Yamurgi) in the southeastern Aegean Sea. 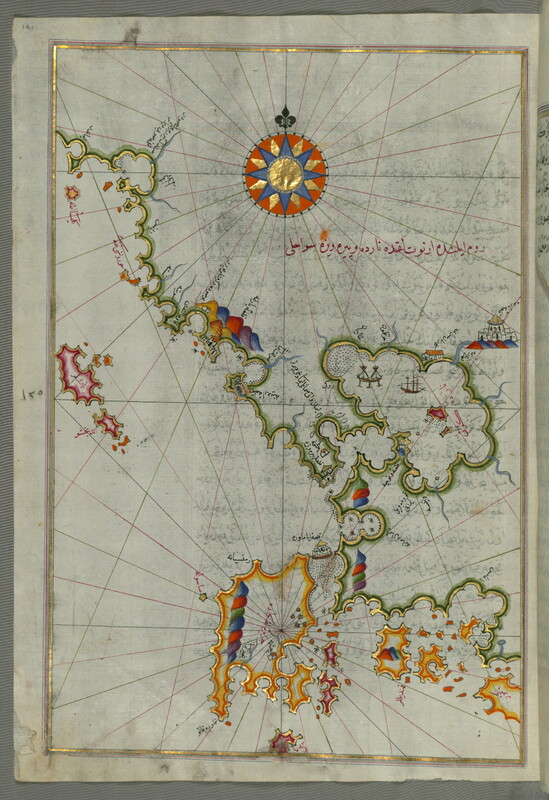 Label: This map shows the island of Naxos (Naḳşe) in the southeastern Aegean Sea. 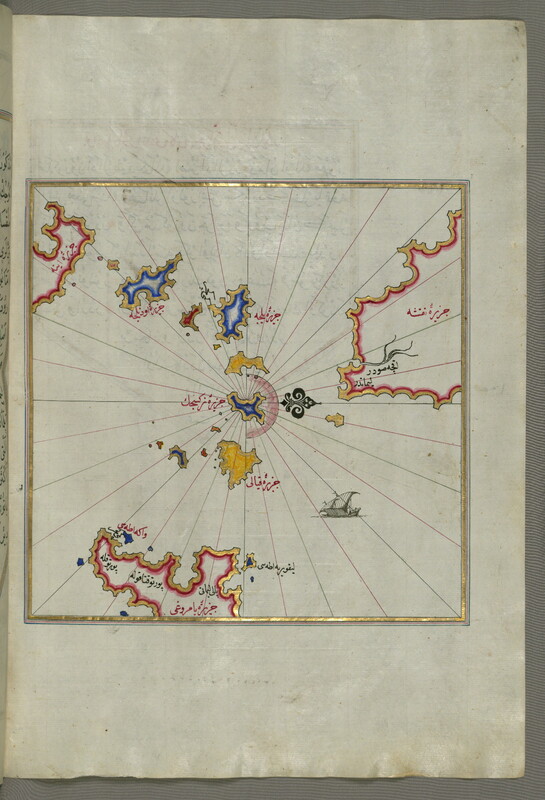 Label: This map shows the island of Paros (Pare) in the Aegean Sea. 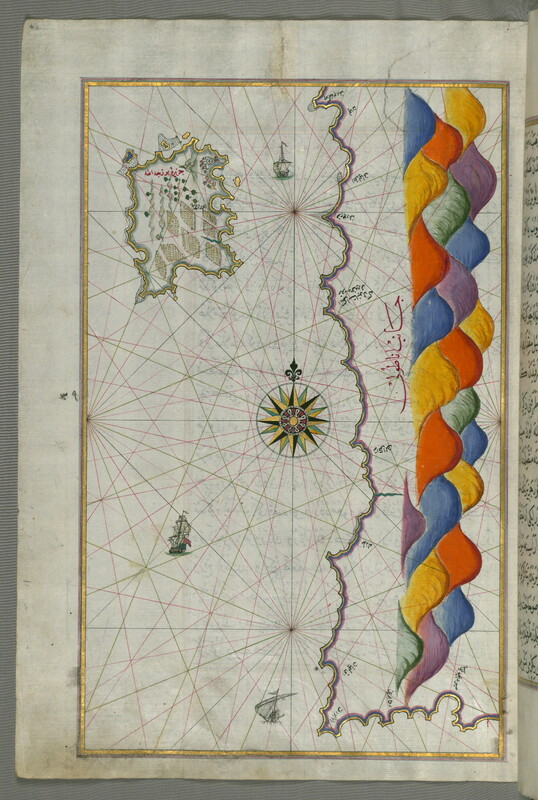 Label: This map shows the island of Syros (Sire) in the Aegean Sea. 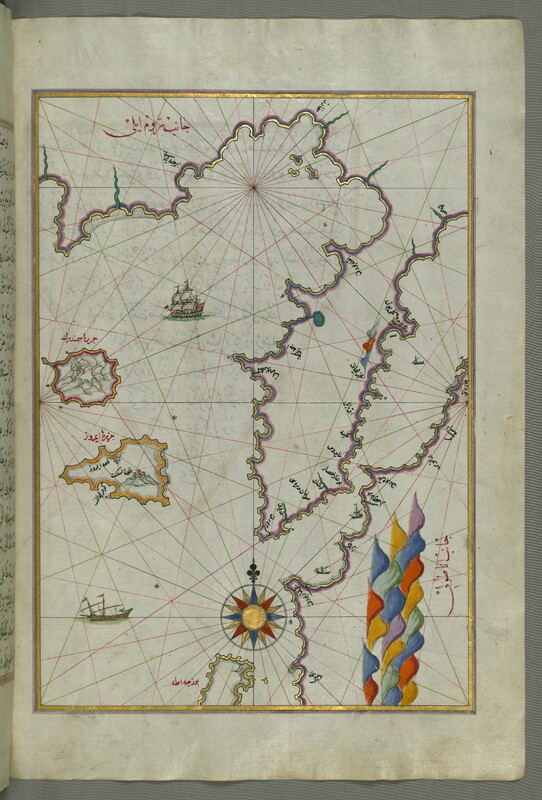 Label: This map shows the island of Tinos (İstendil) in the Aegean Sea. 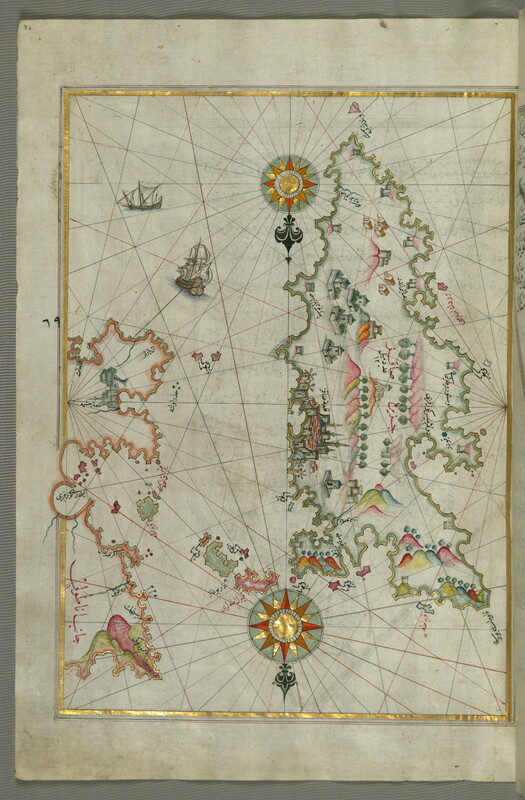 Label: This map shows the island of Andros (Andre, Andra) in the northern Aegean Sea. 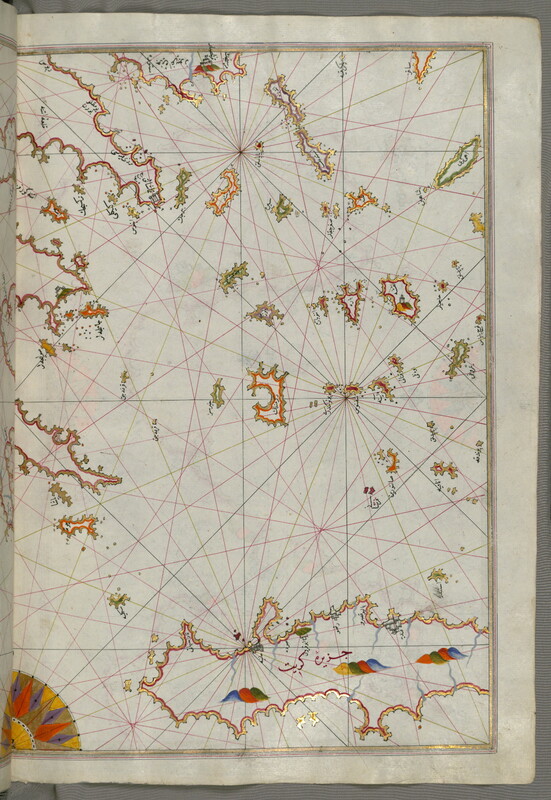 Label: This map shows the Bay of Saronikos (Atene) with the city of Athens. 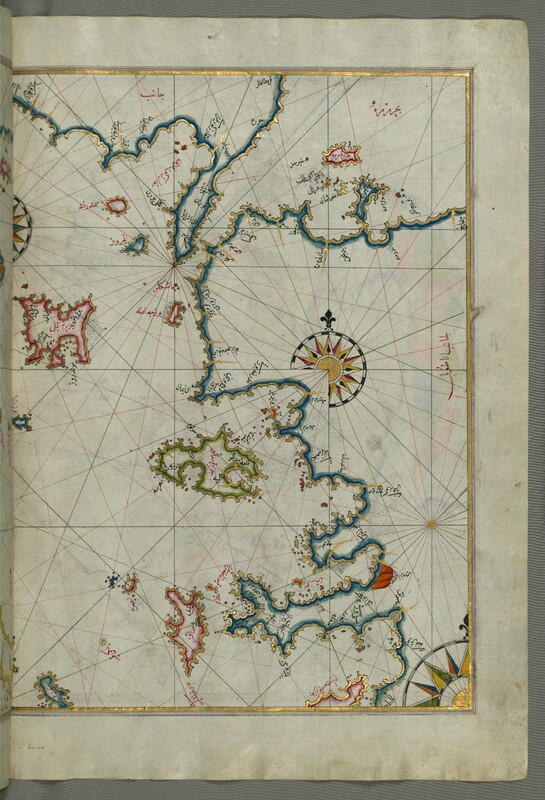 Label: This map shows the Bay of Argolikos (Anaboli). 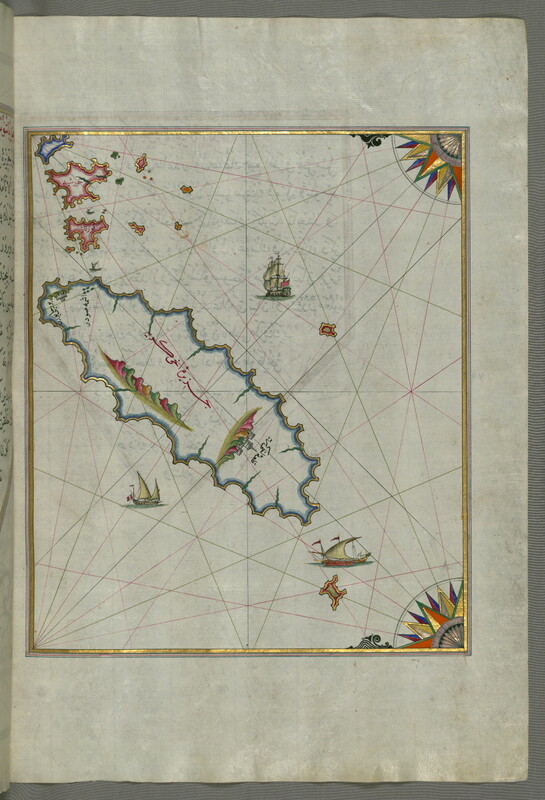 Label: This map shows the Bay of Argolikos (Anaboli) and the Peloponnese (Morea, Mora) peninsula. 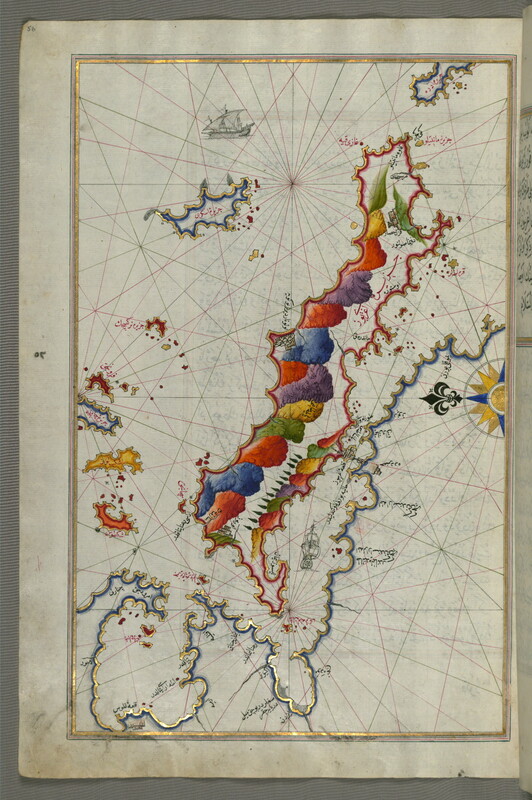 Label: This map shows the stretch of water between the Peloponnese (Morea, Mora) peninsula and the island of Crete with the island of Kythira (Cerigo, Ҫoka). 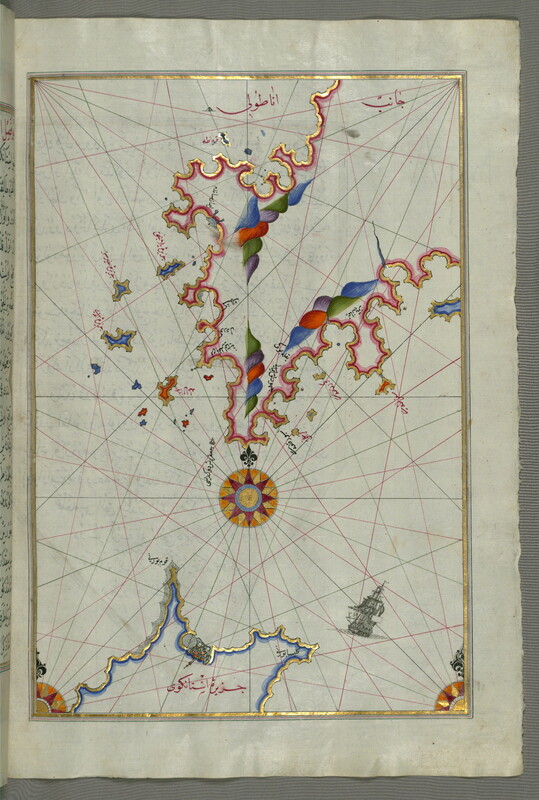 Label: This map shows the Peloponnese (Morea, Mora) peninsula with the island of Kythira (Cerigo, Ҫoke) and the Bay of Lakonikos. 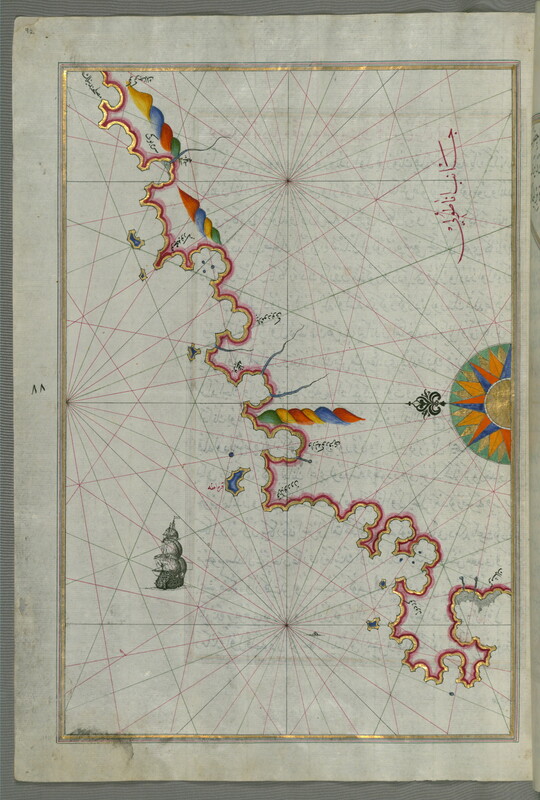 Label: This map shows the Bay of Messiniakos (Messini). 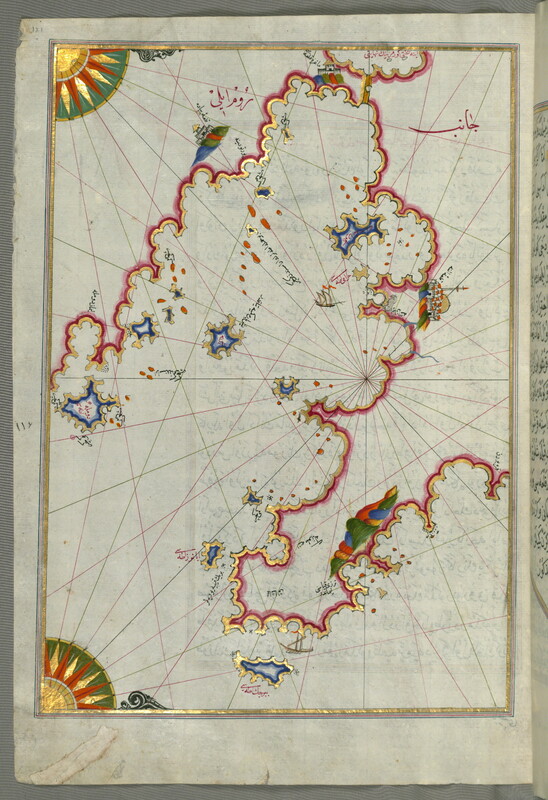 Label: This map shows the Cyclades (Kikladhes) islands between the Peloponnese (Morea, Mora) peninsula and Crete. 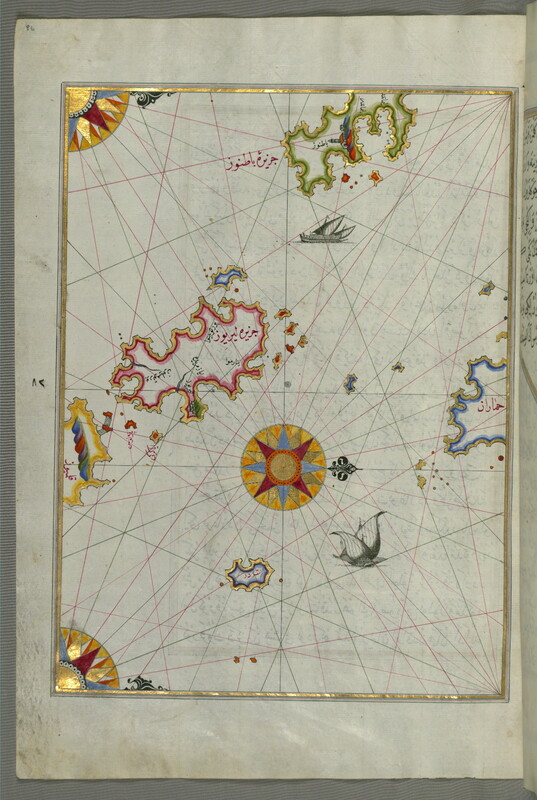 Label: This map shows the islands of Zakynthos (Zākīse), Kefalonia (Kefallinia, Kafālūnye), and Lefkada (Levkas, Leucas, Lefqe) in the Ionian Sea. 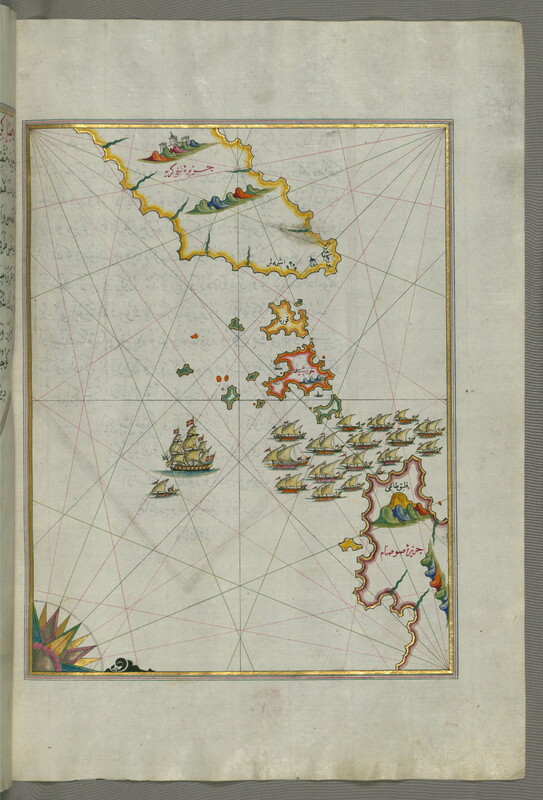 Label: This map shows the Methana (Mutūn) fortress in the Bay of Saronikos (Aiyina). 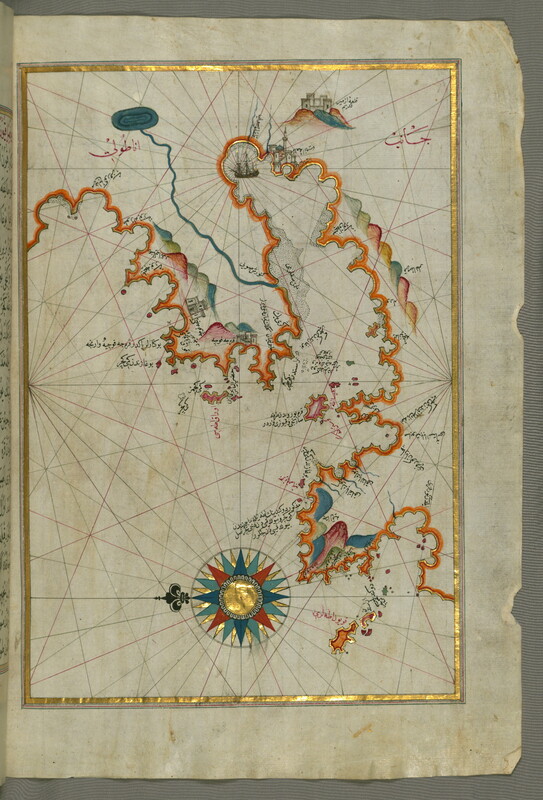 Label: This map shows the Bay of Saronikos (Aiyina). 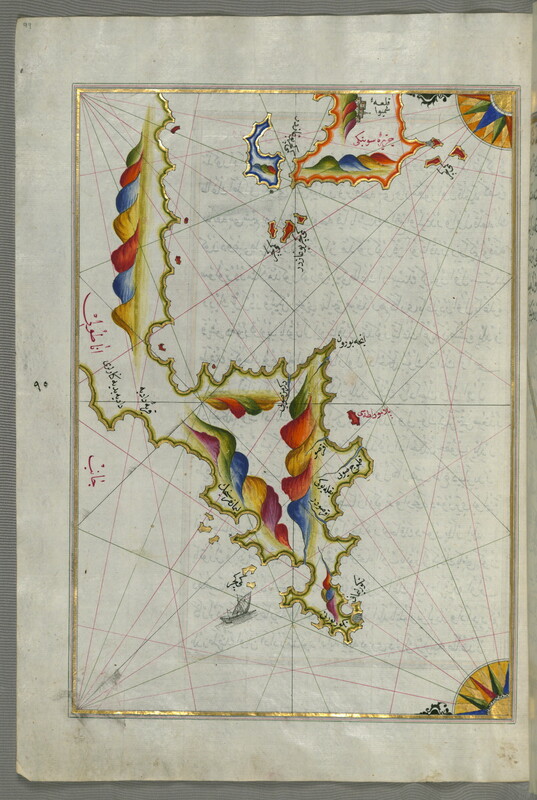 Label: This map shows the eastern part of the Peloponnese (Morea, Mora) peninsula. 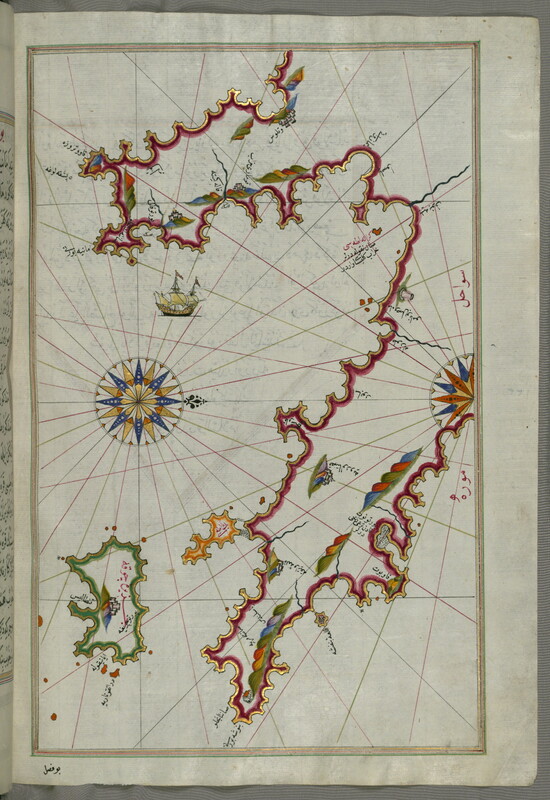 Label: This map shows the western part of the Peloponnese (Morea, Mora) peninsula opposite the island of Zakynthos (Zante, Zākīse). 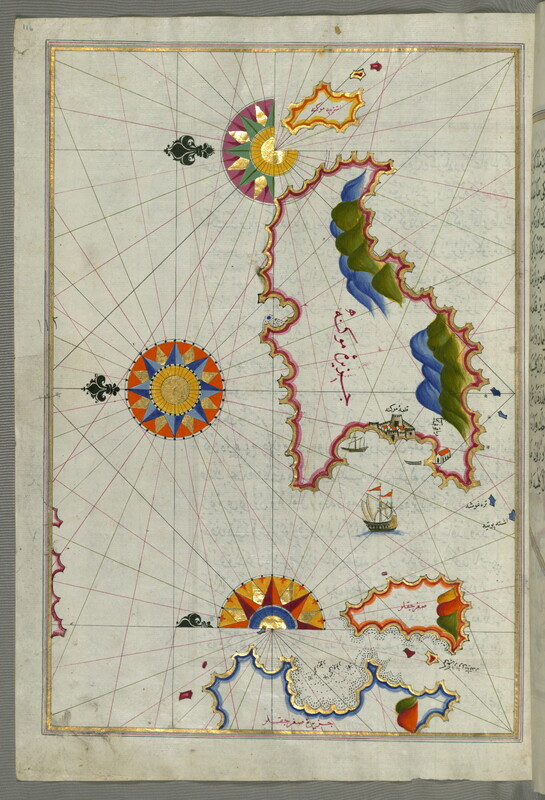 Label: This map shows the islands of Kefalonia (Kefallinia, Kafālūnye), Ithaca (Ithaki, Seyākī), and Aya Mavra off the western coast of Greece. 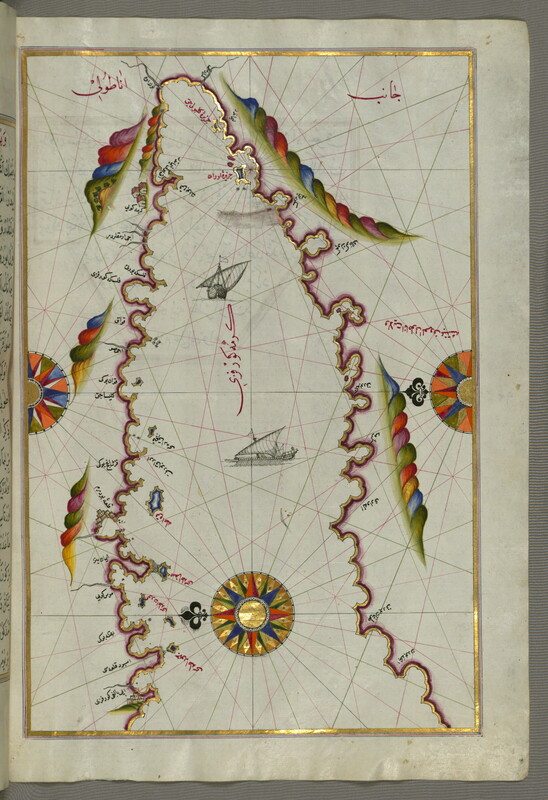 Label: This map shows the western coast of Greece from the island of Levcas (Lefkada, Leucas, Santa Maura) going north as far as the island of Paxi (Paxoi). 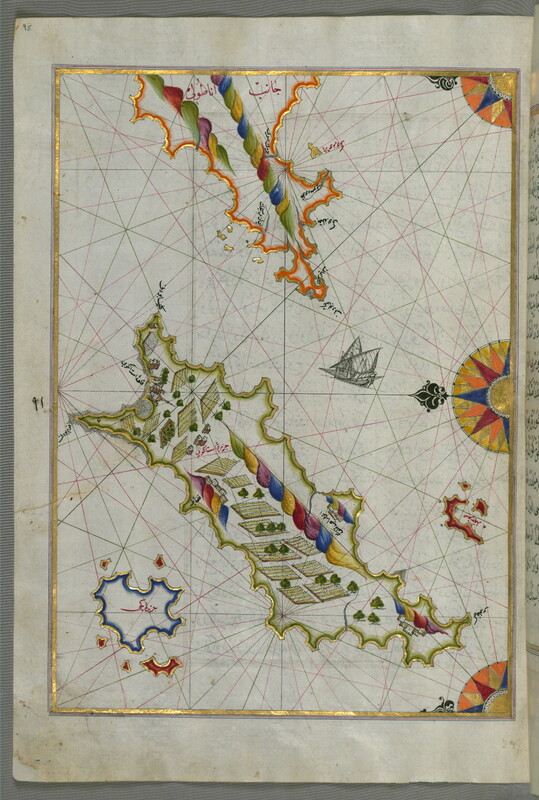 Label: This map shows the area between the islands of Corfu (Kerkira, Kūrfūz) and Paxi (Paxoi). 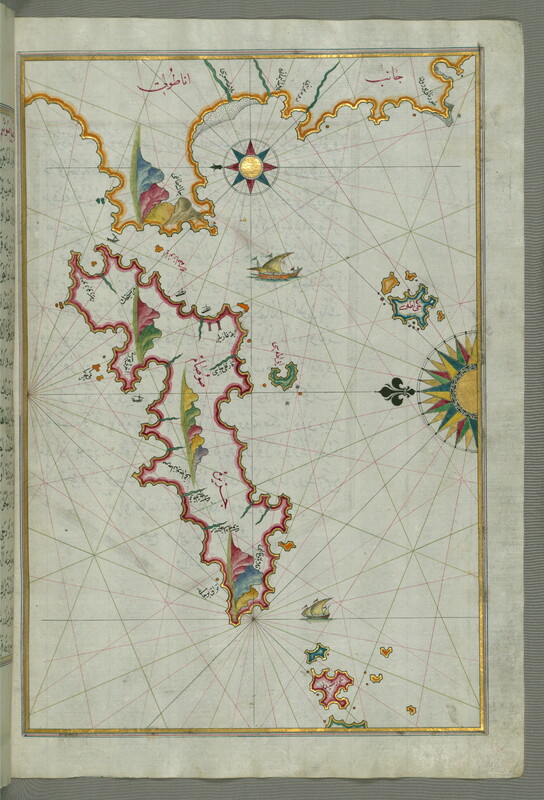 Label: This map shows the islands of Corfu (Kerkira, Kūrfūz) and Paxi (Paxoi). 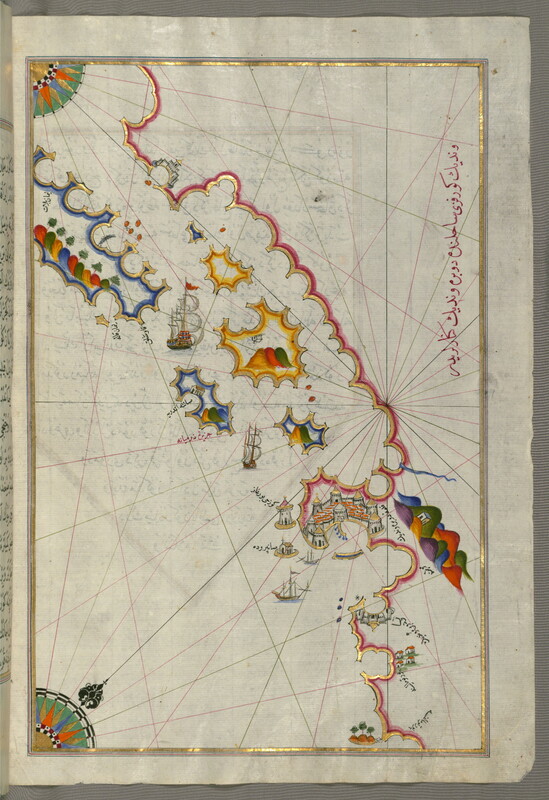 Label: This map shows the Adriatic coastline around Karaburun and Vlora (Valona). 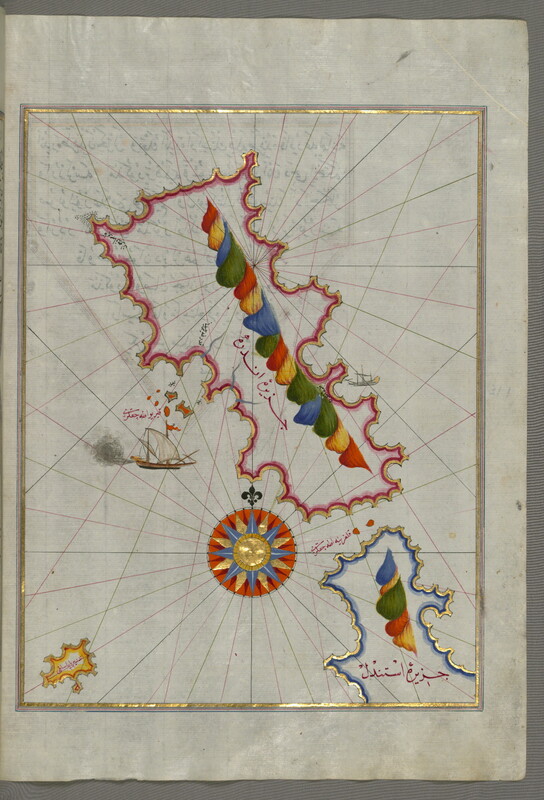 Label: This map shows the Adriatic coastline from Drač (Durezzo, Trāj) north of Karaburun as far as Budva. 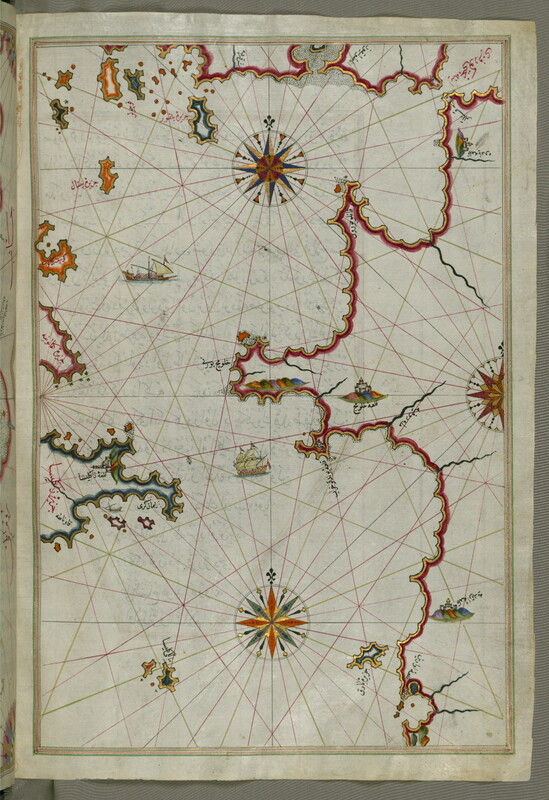 Label: This map shows the Adriatic coastline from Budva to Dubrovnik (Dūbre Venedīk). 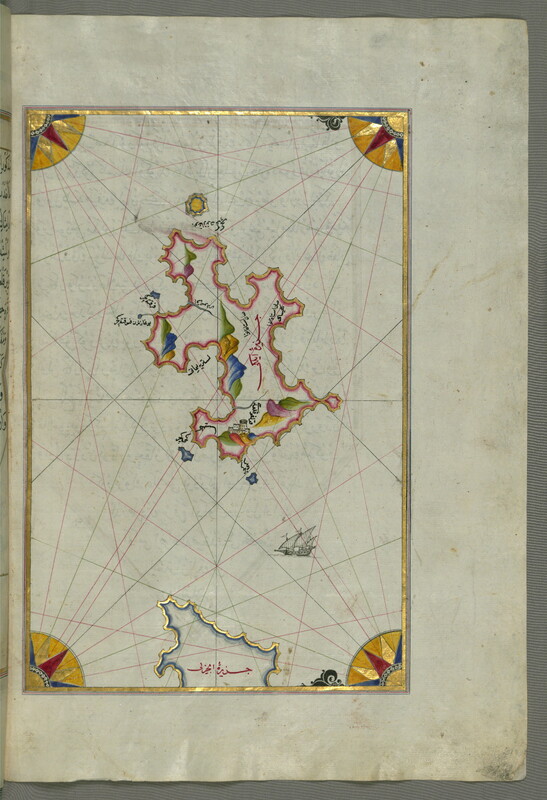 Label: This map shows the island of Mljet (Mīlede) off Dubrovnik. 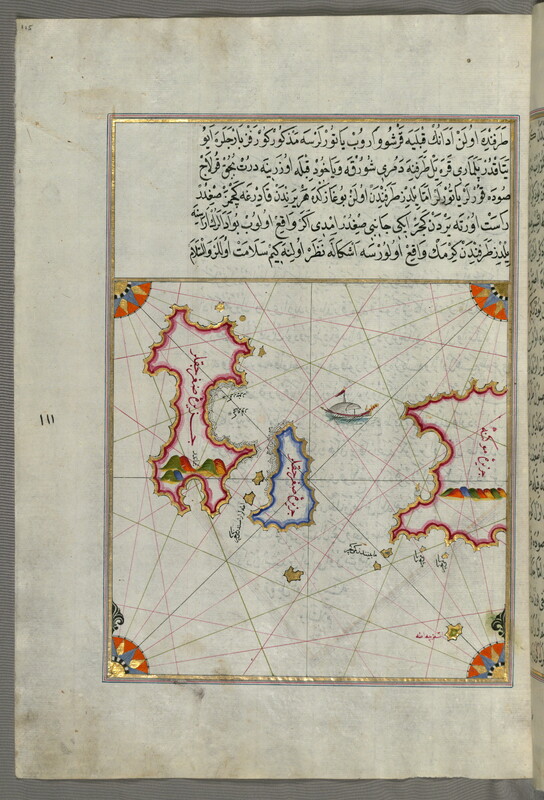 Label: This shows the Dalmatian islands of Korčula (Qūrsūlah) and Lastovo (Augusta) off the coast between Dubrovnik and Split.